Well, here we are again almost into fall and the crabapple trees at BiCentennial Mall are blooming, but only a few here and there. 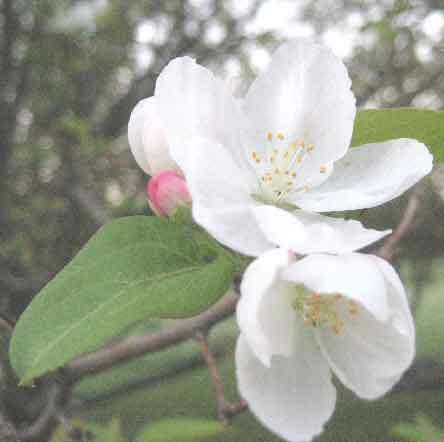 The length of days are similar to Spring, so some of the brighter trees think, "Hey, let's bloom!" 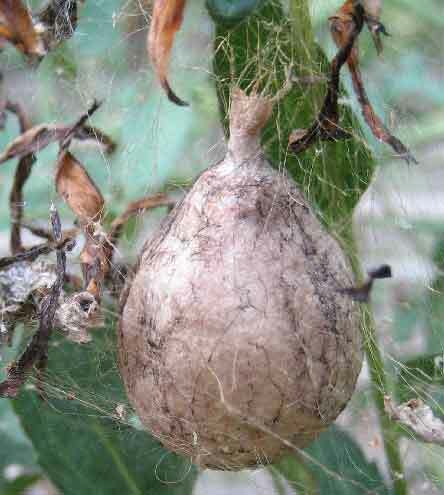 Sherry found this spider nest in her big flower garden. 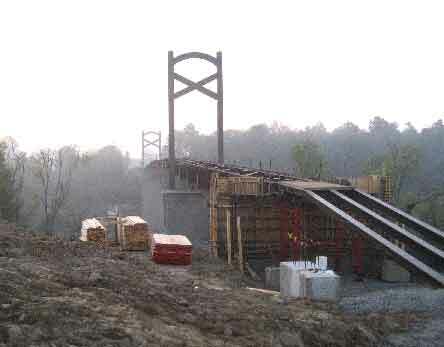 I've been curious to see the greenway footbridge over the Cumberland so I walked into forbidden land Tuesday morning. Me and several others. 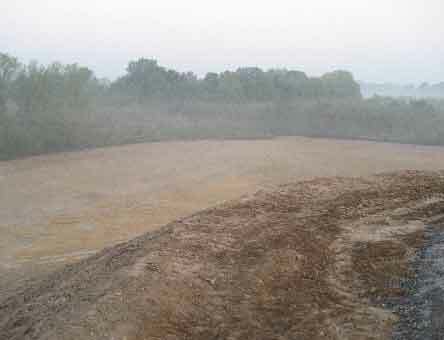 This is the view of the huge mound that has been built so that the Shelby Bottoms side will be approximatly as high as the Two Rivers side. This is not a flimsy bridge. Solid steel with cables from the towers supporting the center. Wow! A lot done already, but a lot still to finish. 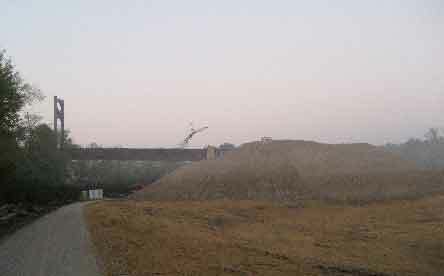 From the top of the SB side you can see the huge excavation made to provide the dirt for the ramp. It is a gradual spiral climb to the top, suitable for bikes and wheelchairs. I assume there will be a lake below. 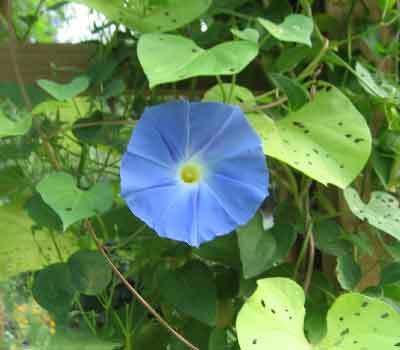 I love morning glories. This is a wild one which I thought was the same "heavenly blue" color as those on our arch. But, as the photo below will show, it isn't. Hi, misquito! 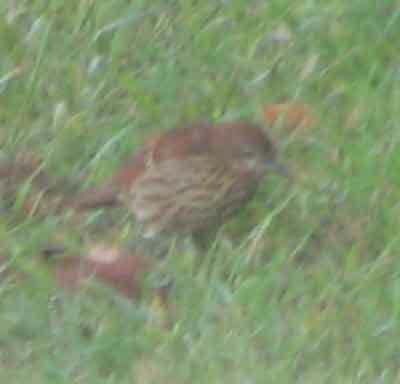 Not a very good photo, but a brown thrush is pretty rare and doesn't like to let you get close. Hi, Mr. Bird! 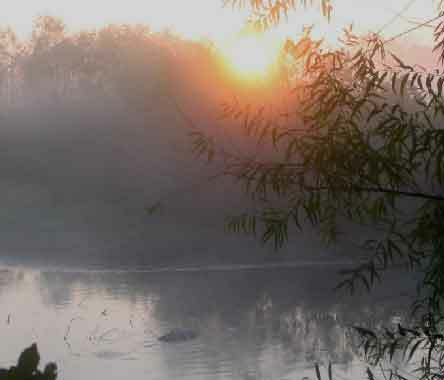 This sunrise shot over the pond at SB has a new feature. On investigation I got a shock. The mound in the middle is a dead deer. 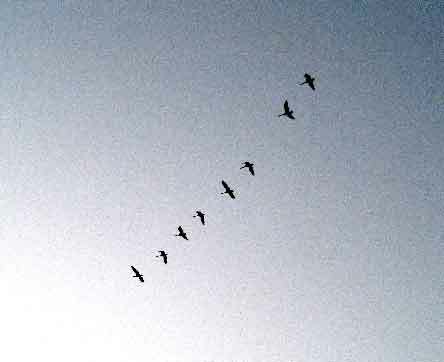 Fall for sure, the geese are beginning to fly in formation. 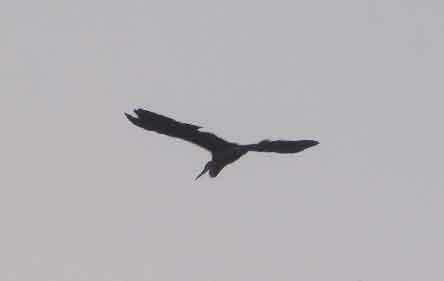 This blue heron flew over the pond while I was watching the plover and the swifts. 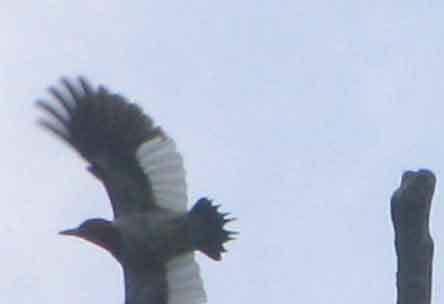 He was going to land and circled several times, but decided against it. 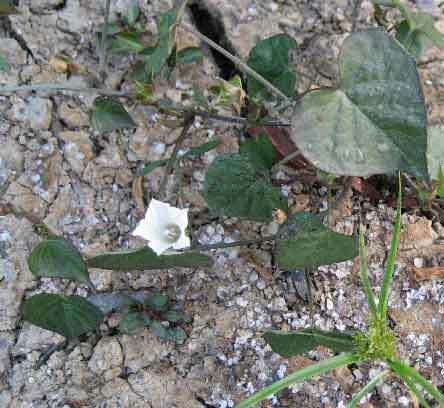 I don't know what little flower this is, but it is growing on what was the pond bottom not long ago and will probably be again when (and if) the fall rains come. This plover was systematically working its way around the edge of the pond finding minnows, I saw it catch several, and other edible goodies. 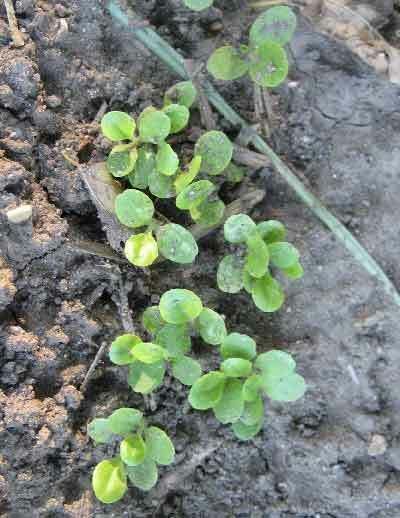 The lettuce I planted not long ago is doing well. I'll have to thin it and weed it again next weekend. 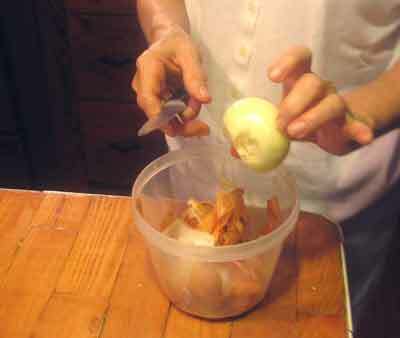 The turnips are fine, but there are gaps. I'll try to transplant some of them when I thin. The continuing squash saga. 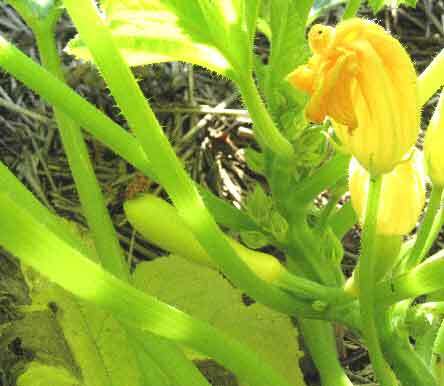 Notice the baby squash and the several blossoms. I hope I don't over water it. Boy, I would love to get a late crop. I love squash! 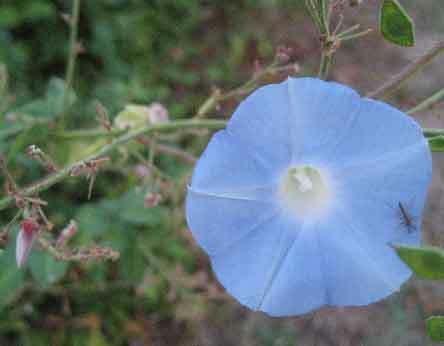 Here are some of Sherry's Heavenly Blue Morning Glorys. I guess they are a deeper color than the wild ones. 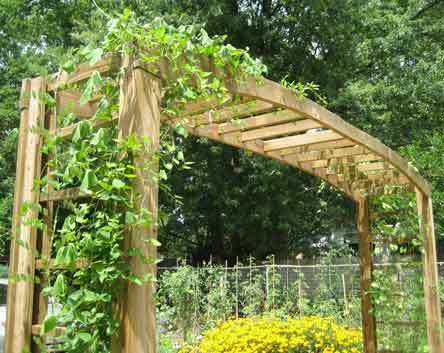 The arch is really getting heavy with several kinds of vines and their blossoms. Blue, red and white--kind of patriotic. The flume is open again below the dam at Center Hill. 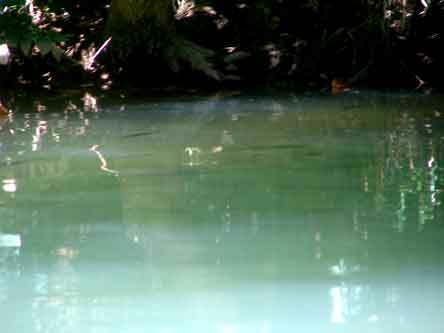 It is supposed to supply oxygen to the water, which is good. 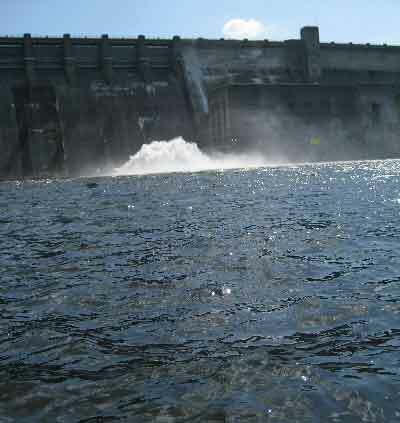 However, it makes the lake below the dam pretty rough for my little 12' jon boat with its tiny electric motor. 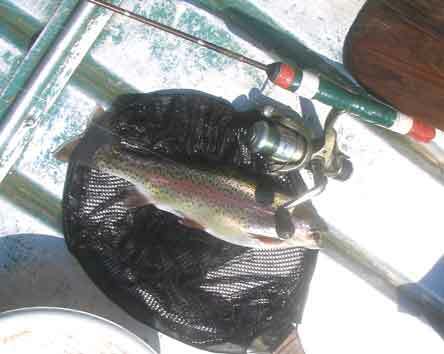 However, after three hours of fishing I had six rainbows which I cleaned and took by to Ed. I hope he enjoys them as much as I enjoyed the turkeys I killed on his farm. More rain this week, but we have still had only half the normal amount to date this year. It seemed a dull week, but lots of little things add up and, looking back at these photos, I see how full it was. Sun comes up later now, around 6:30, so lots of my walk is in darkness and moonlight. 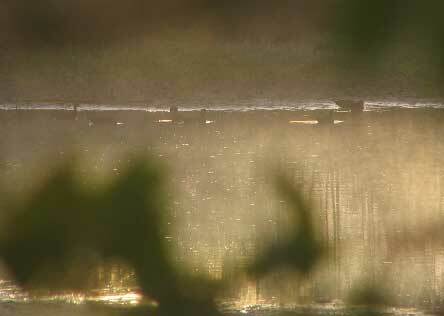 Shot this family of ducks on the pond at SB which is now a little larger than last week. Still fairly dark and I'm shooting through some bushes. 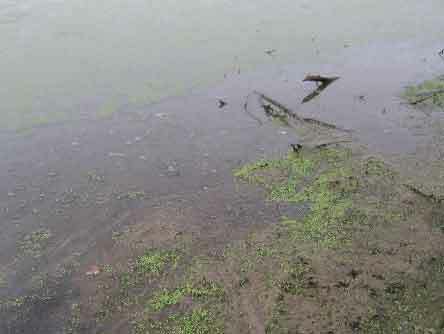 The large cracks in the lake shore are still there, but they aren't as wide and grass is already growing out of them. 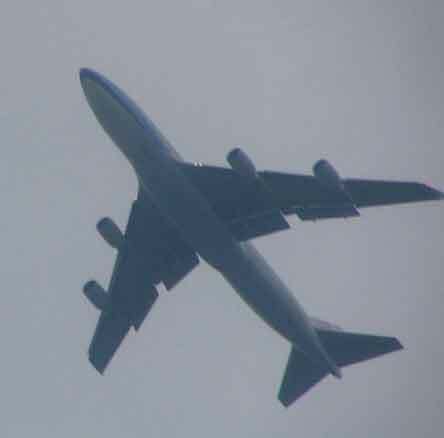 Finally got a good steady shot of the huge cargo plane that comes over around 7:00, making the ground shake and seeming to float, rather than fly. 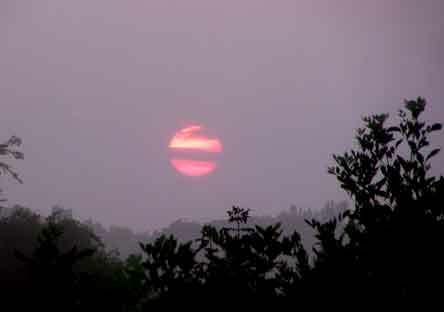 Thursday sunrise and the rain is over now. Another hot day and week to follow. 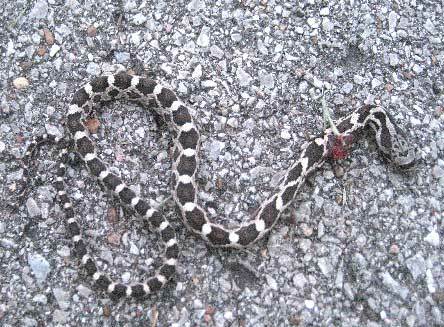 Only one wound on this pretty snake, so maybe it was a hawk or crow and not a stupid human who did it in. 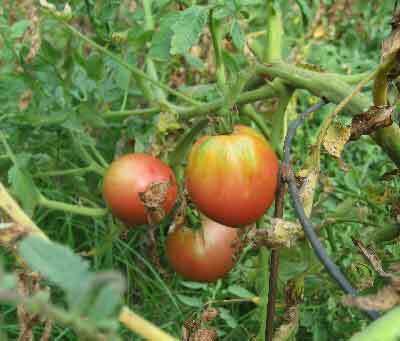 We still had some nice cherry tomatoes this week, but they are almost gone now. 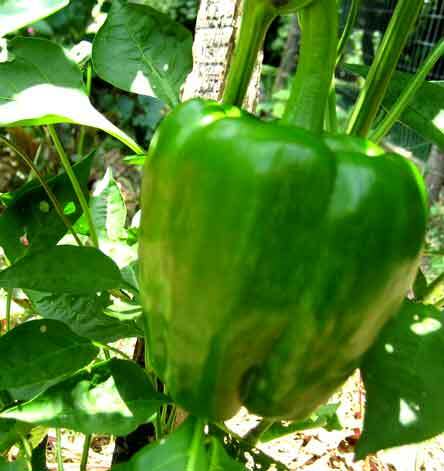 Green peppers are coming on still, but two large branches broke off and 7 or 8 good peppers were lost before I noticed. Breaks my heart sometimes. 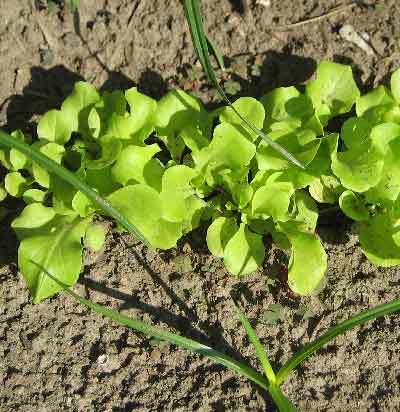 The new crop of lettuce is coming in. Hope it has time to get big enough to eat. Last year it over wintered. Maybe... One of the last Bradley's, miraculously undamaged by birds, squirrels, rabbits, or insects. Thanks be to God. 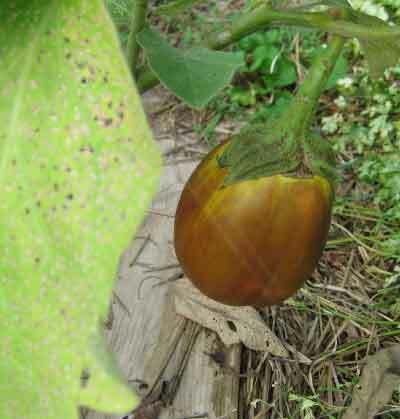 The eggplants that started out so well have suffered in the drought. 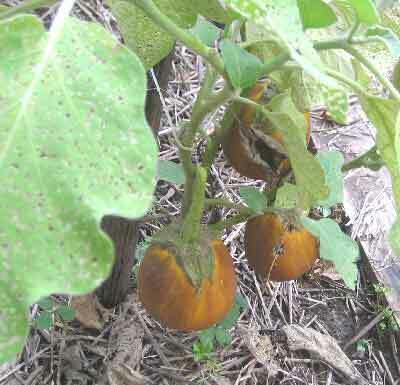 The bugs are now working over the leaves and the fruits have a pale, unhealthy look. I hope extra watering can bring them back. We will see. Sherry's calla lily just keeps on putting out more beautiful blossoms despite drought, japanese beetles, and babies. 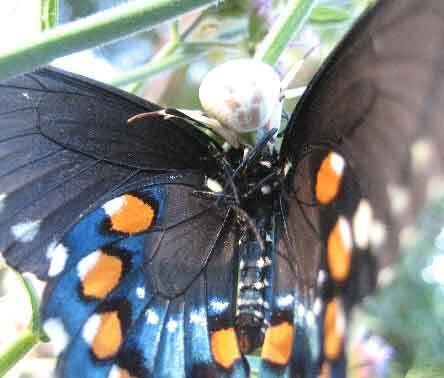 Saw this swallowtail hanging at an odd angle. When I touched him he dropped an inch and stopped. This bulbous white spider still had him by the antenna. We left him at it and later Sherry brought in the wings--all that was left. There are two of these magnificent "writing spiders" by the arch. 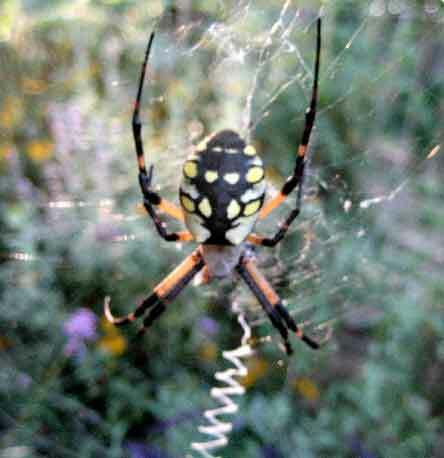 I try not to knock down the webs when I cut the yard, but they string them so far out that it isn't easy to miss them. 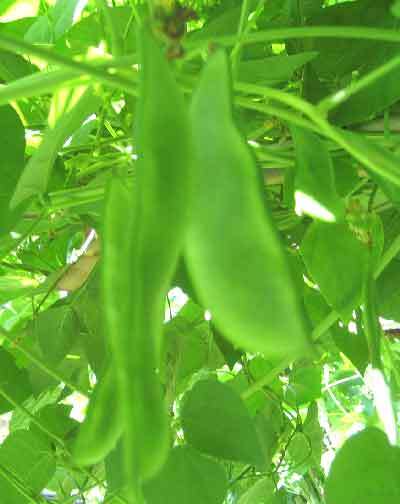 The bush butter beans in Travis' garden are dried out or molded or still flat. 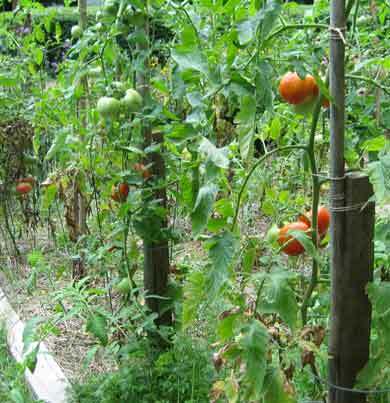 The ones on the poles on the hill, however, are coming on nicely. 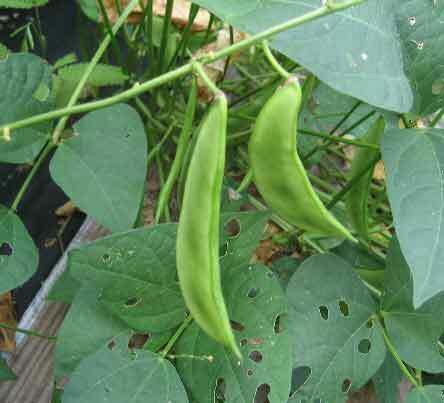 If they get enough sun before frost we may have a bowl of butter beans yet. Still lots of blossoms and some beans that need to fill out, but the prospects are good. Cross your fingers. 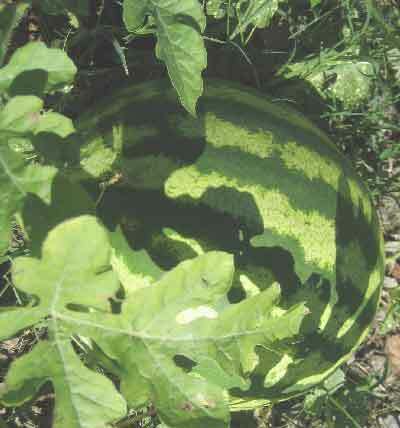 Great crop of watermelons this year. This striped one... and this one called "Moon and Stars." Both are tasty. 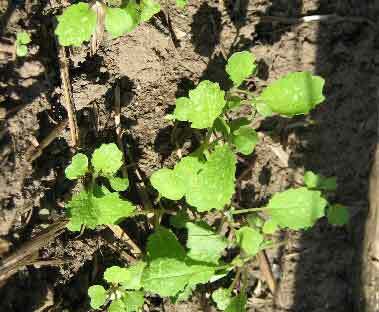 Travis had a good crop last year too. Yum! and this kind for eating and sharing with the birds. 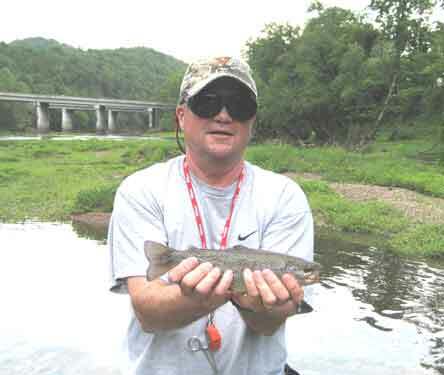 Had a good time fishing below Center Hill Dam Sunday. 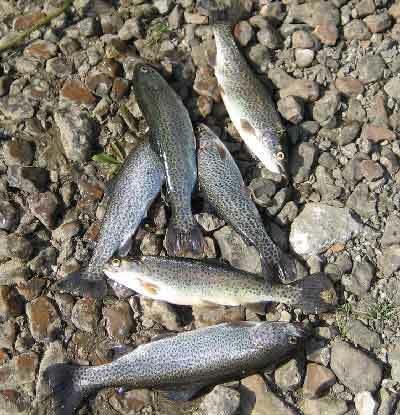 Caught 6 rainbows which we will eat and one 14" one which I let go. Here's the big guy. We finally got some decent rain on Sunday, September 9. 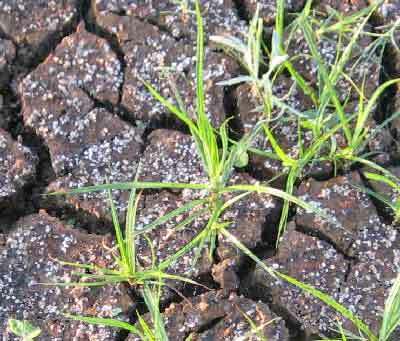 God only knows how long that drought was or whether it is really over yet. It's going to take a lot more to get things back to normal. 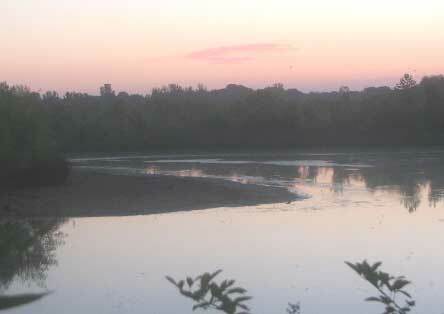 On Tuesday morning at Shelby Bottoms pond and it is still shrinking. 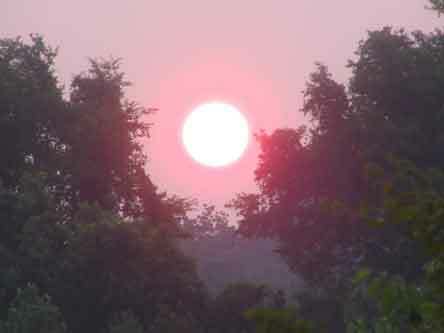 The sun comes up in thick haze and only a small chance of rain predicted all week. Light is coming later now and not much going with the birds and critters. 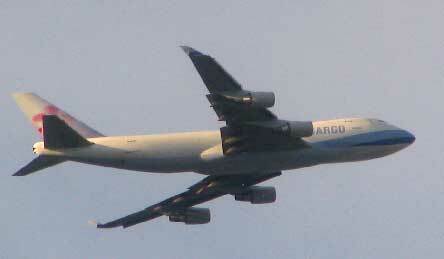 I did get this shot of a huge plane that comes over every morning. It is so big it seems to hang in the air and go so slow it seems impossible it could fly. 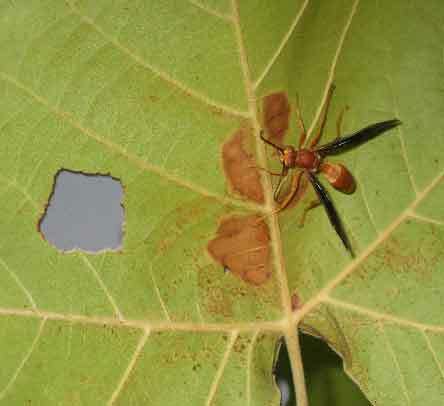 Wednesday there was a little mist of rain, enough for this red wasp to take refuge on the underside of a leaf. 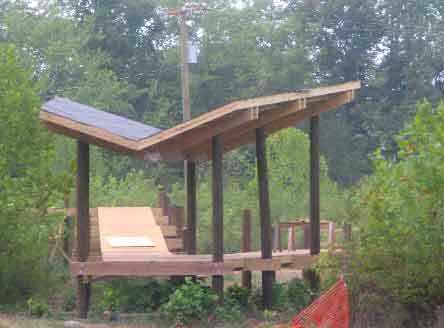 I walked down to the park entrance to see how the nature center was coming along. Just that minute a freight train went by over the bridge. The center is coming along. I must certainly be sure to show up for the grand opening. 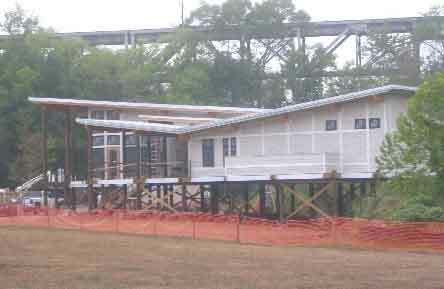 There will be a neat walkway from the parking lot. Well, this was the long Labor Day weekend. Got a lot done and got to go to the creeks twice. Nice. Saw this buck at SB. 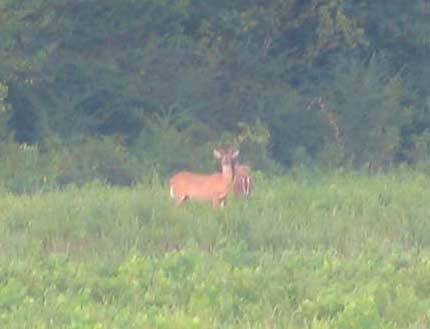 He was with a doe, a yearling, and two fawns. Never got a shot of the five all together and they were pretty far off. This is the best of the shots I got. 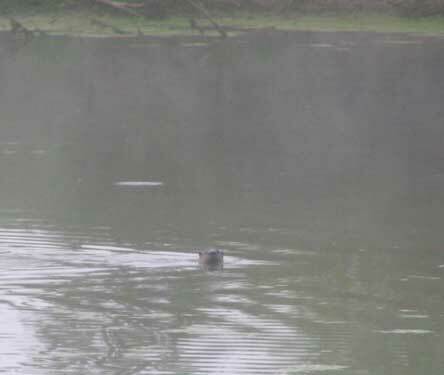 That's the otter swimming pretty close, but I didn't have the 10x zoom camera. 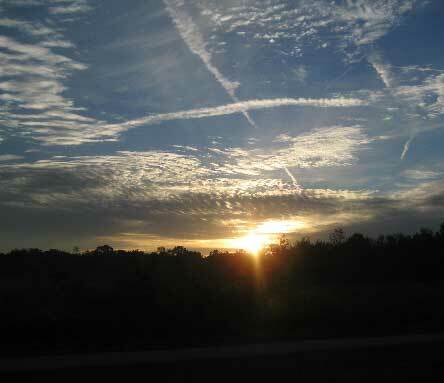 It was early, around 5:45. Next day I had the big camera and got this shot. But this was the last time I saw him. I think he headed for better water down on the Cumberland. The pond is shrinking. 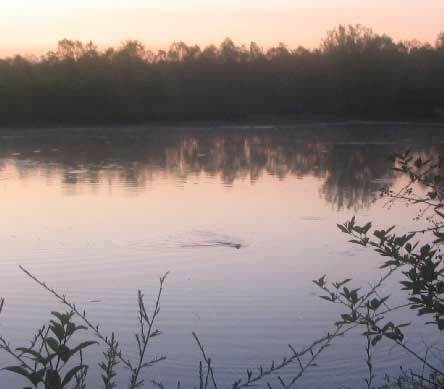 Not long before sun rise and the pond is still and all you can hear is the strange buzzing noise made by thousands of minnows flipping up out of the stagnant water for a little oxygen. No rain in the forecast for this week either. 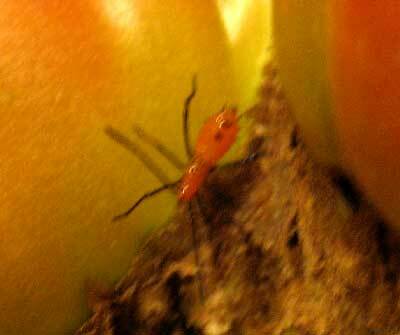 We found this tiny but beautiful bug on a tomato. Possum grapes are filling out on the vines at SB. 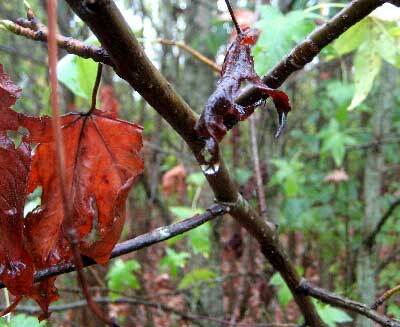 Water hangs from a dead leaf, but the light rains Thursday did little to relieve the drought. 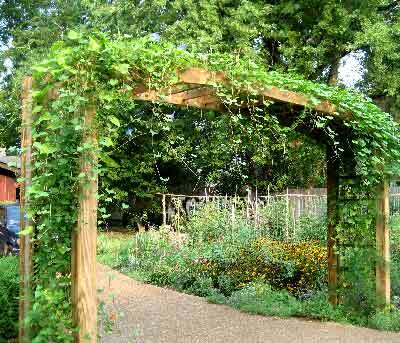 The arch is filling up with vines and their flowers. Nice. 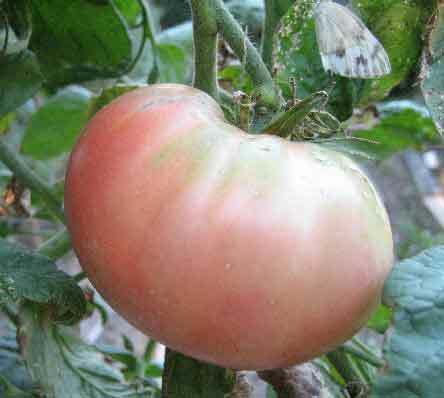 There are still a few "big" tomatoes and lots of cherries. 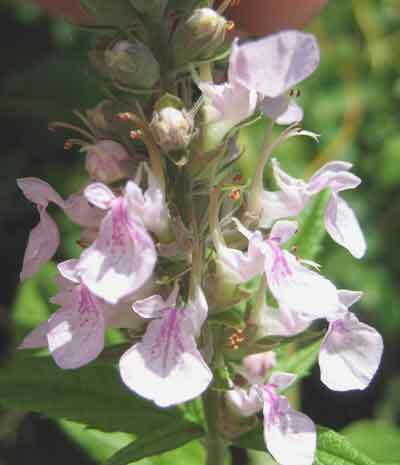 Saturday I finally started weeding the garden. On the left is what it looked like before I started. 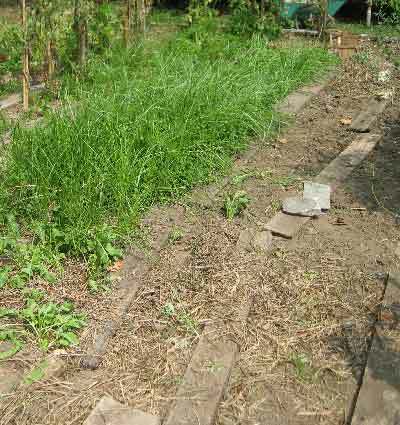 Note the patch of straw at the bottom right on the area I had weeded. When I finished, finally, pulling all the weeds. I was raking the straw up so I could plant some lettuce and under that patch I mentioned were these three baby bunnies. 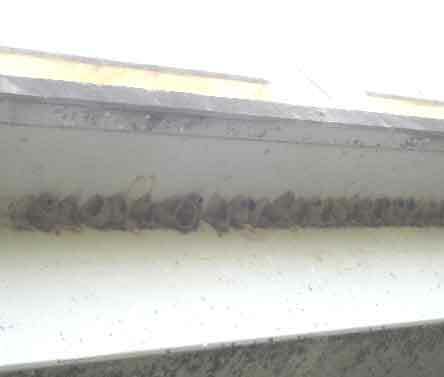 How their mother could feed them and get the straw back over them so well when she left I have no idea. The little nest was only a few inches deep. 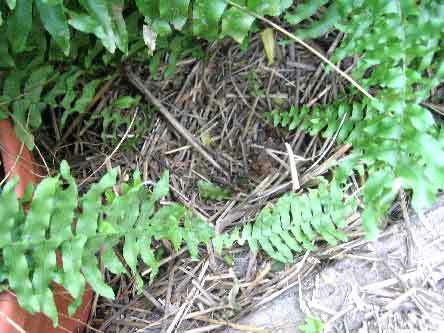 I covered the bunny nest with straw and put one of Sherry's ferns on either side. 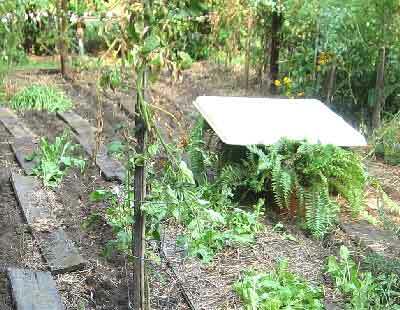 Then I planted the lettuce all around the site. Since I needed to water the seeds, I put a plastic roof over the nest. 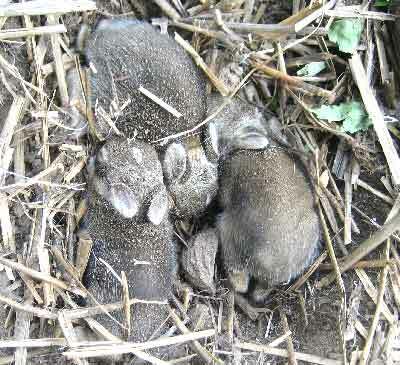 There is no way to tell if the mother rabbit will come back and raise the babies or if they will die. However, I think by staying away as much as possible and resisting the temptation to interfere they may have a chance to become big bunnies who will eat my veggies next year. Sometimes it's hard to decide which side you are on! 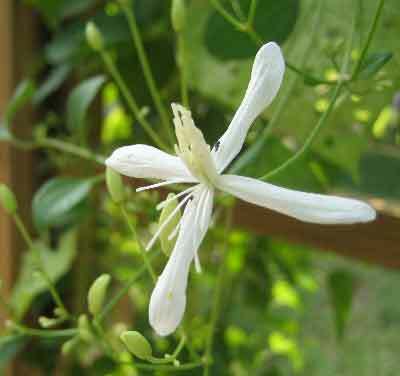 This clematis is one of the beautiful blossoms on the arch. 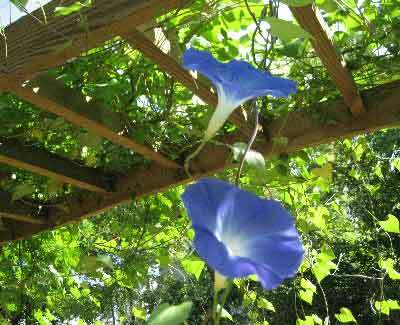 This heavenly blue morning glory makes the arch glow. 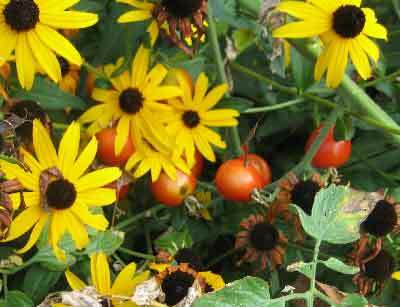 One of my Saturday chores was to dig these wandering tomato vines out of Sherry's black-eyed Susans. 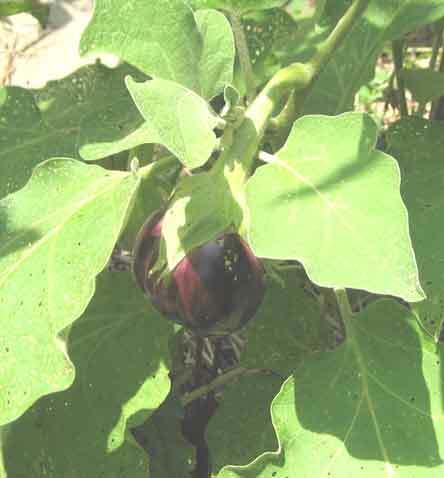 My eggplants were doing great but now drought and aphids are hurting them and the strain has changed their color. 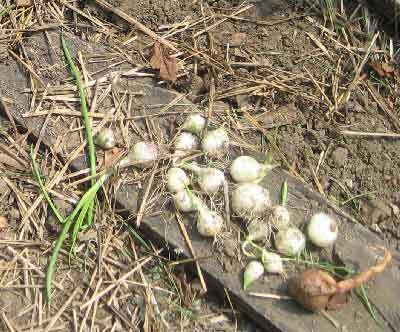 One bonus from the weeding was finding all these onions lost in the weeds, most are the ones planted from seed, but there were a few of the brown ones from sets I missed. 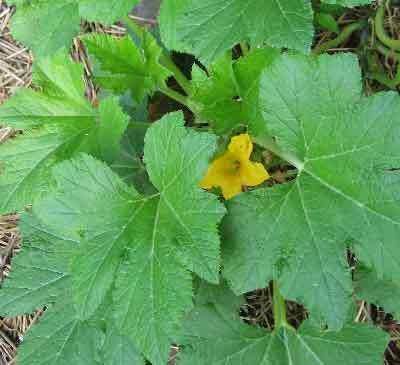 Of the several squash plants Travis and I planted one only still is going. I've started giving it extra water. We'll see. Sherry and I took the two person kayak to Creek J on Sunday and while we were right under the cliff you see above a turkey glided all the way across the inlet to the other side of the water. 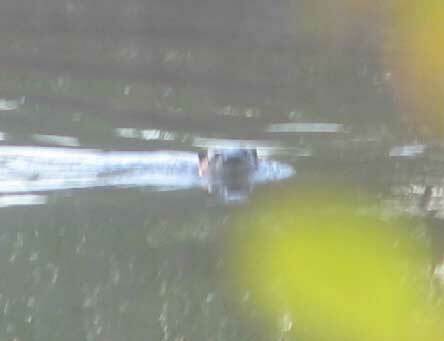 Later on, we twice saw a pair within 30 feet of the boat. 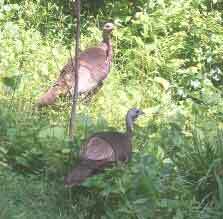 Both times they just stood and looked at us, but not long enough for me to get the camera up and shooting. All I got was empty shore line. Shoot! 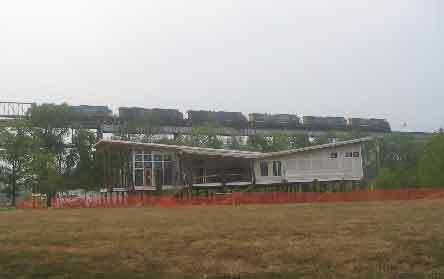 (But, to show you what I missed, I got a shot off the web.) 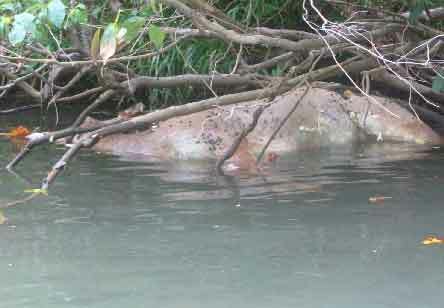 Farther up the creek we noticed a not too pleasant smell and I spotted a dead deer caught in some limbs. Poor little deer. I didn't fish a lot, because we were there to look and enjoy, but I did get lucky once. What fun. 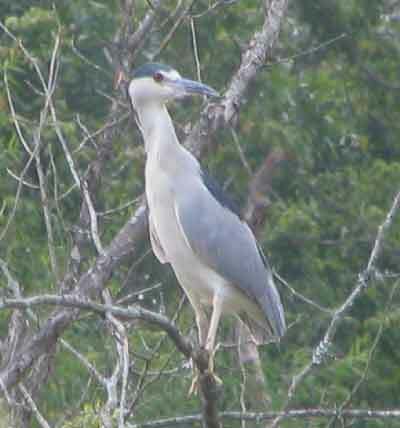 I got really close to this black crowned night heron. 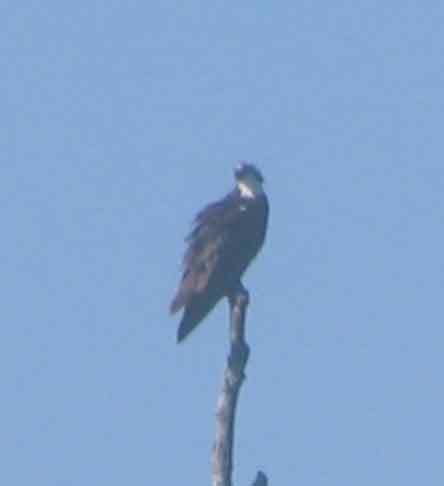 We also saw an osprey flying with a fish in his talons and many song birds. 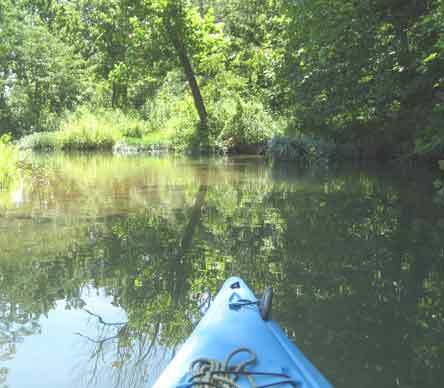 The kayak is quiet and can go in very shallow water, so we glided along the bank and saw a lot. Monday was labor day so I went down on Creek Y for the first time this year. 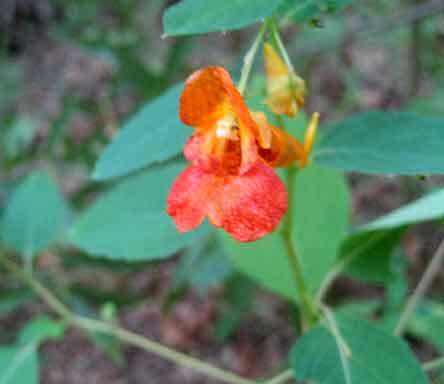 Saw lots of humming birds, or one bird several times, mostly on this jewel weed. 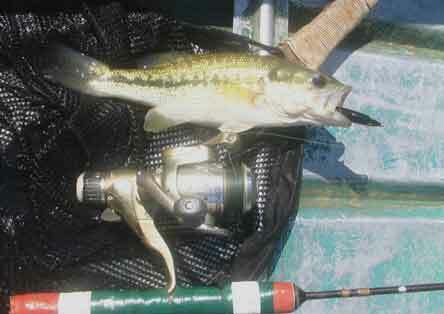 This hard fighting little guy was the only one I caught, although I had several near misses from really big ones. As you can see, the creek is crystal clear with no rain for weeks. It was hot, so wading up to your shorts feels good. Remember when I saw the bubbas throwing sticks and rocks at the snake in the swallow's nests? 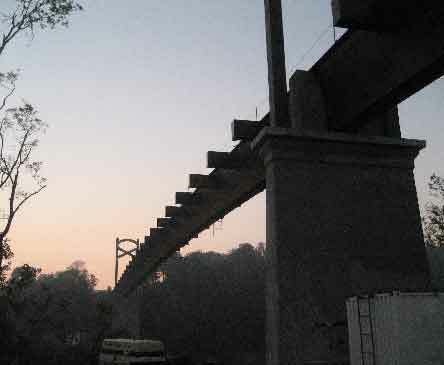 Look at the overhang on that bridge! How did the snake get up there? 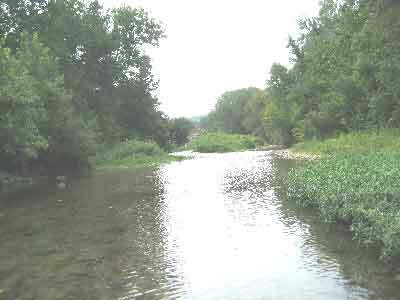 This is one of the finest creeks in Middle Tennessee. It is clear and mostly rock or gravel bottom. 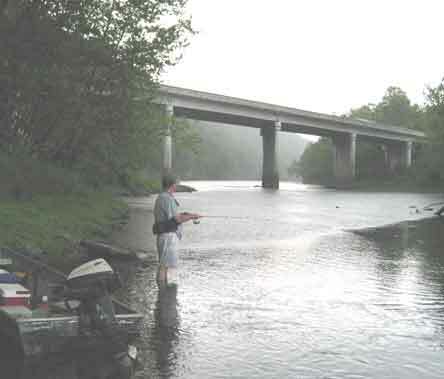 I've seen some smallmouth here that would break your heart and caught a few that were bragging size. Today wasn't my day, but just knowing they are there is enough. I'll be back. Well, the heat and drought are still the main features of this summer. 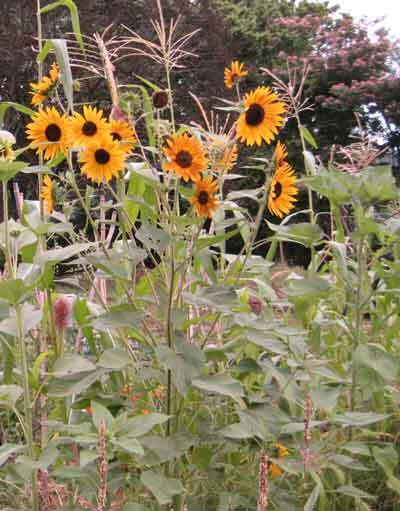 Much of the garden is done, but there are still some things to come. Big deal for me was on Saturday when I took the jon boat and the little motor up to Creek J. I took my 10x lens camera and had a great shot of a water moccasin. Believe me, I fish creeks enough to know when I see one. 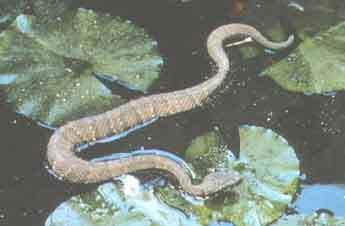 You may mistake a water snake for one, but you will never mistake a real one for a water snake! For one thing, they swim all on top of the water. 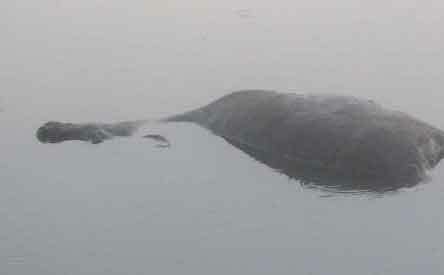 For another, they are short and thick with a definite neck that flares out into the big head. Plus, they exude danger! So, when he stopped on his log and looked me over I got a great shot. The view screen said, "No memory." I had taken it out and not put it back. 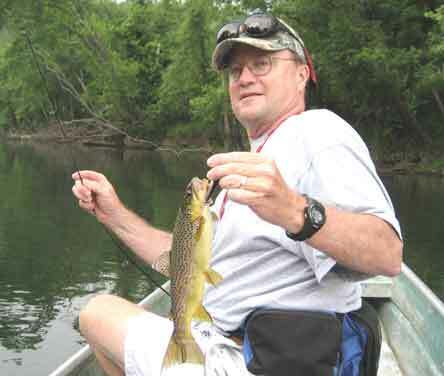 Then, near the end of the day at the top of the creek that I could reach in the boat, sitting on the log across the creek, turned sideways, with my feet holding the boat, I cast way up to the top of the hole and saw a huge shape charge the lure. I twitched it and was on the biggest smallmouth ever. I prayed and worked and nearly lost the boat, but got him to the log. He was probably a she, but at least 20 inches or more. Wow! Of course, no camera. I expect there will be some who feel I may have been making a "fish story" up. Can't you trust me after all this time? Finally, on the way back to the ramp, I broke a sheer pin. This is bad. The prop won't turn without it. 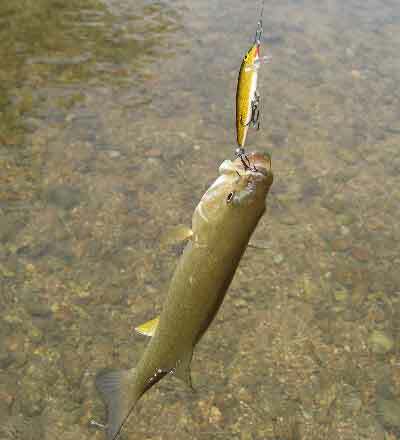 I had nothing that would work except a goofy lure I had bought for trout. I managed to get it in and it worked for a few hunded yards and broke. I did it again with the second of the three I had (thank God I bought three!). 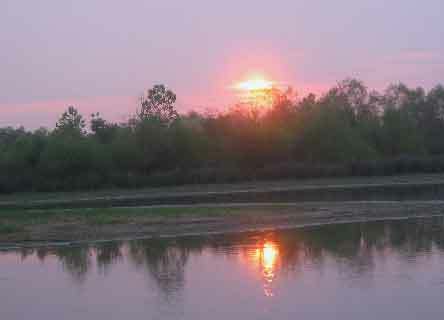 The second got me to the dock and home on time to go to Nangay's art exhibit with the kids and Sherry. It was excellent and we actually bought a painting. I'll show it to you when we get it. 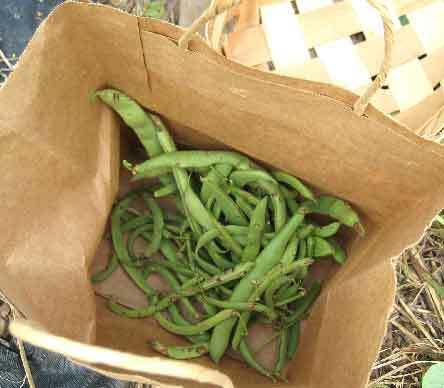 Oh, I also picked some beans and checked out Travis' garden. That's in this report too. I don't know how many days we have been without a real rain. 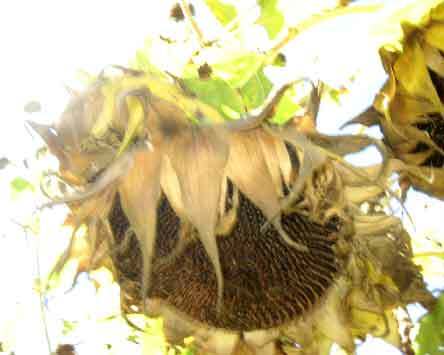 The farmers are done for and my garden would be toast without watering. Hope things get better soon. 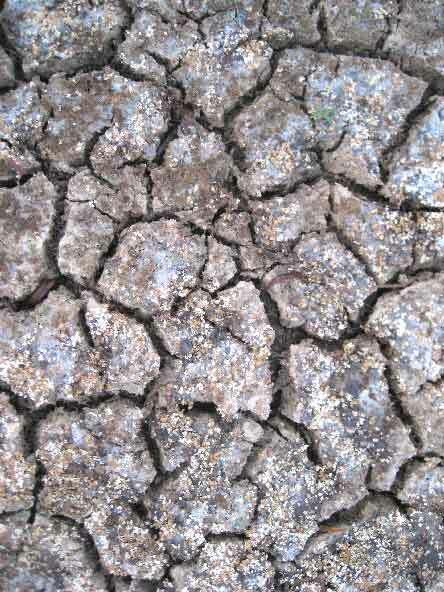 Cracked mud and deal water plants at the pond at SB. A little further out the scum and water plants are taking over. The pond shrinking daily. 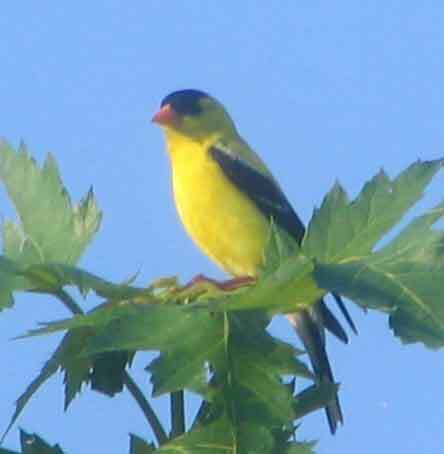 This goldfinch found the mimosa flowers worth eating. So I picked what little was left of the string beans. Not a lot and most pretty flawed. I pulled up the bushes. 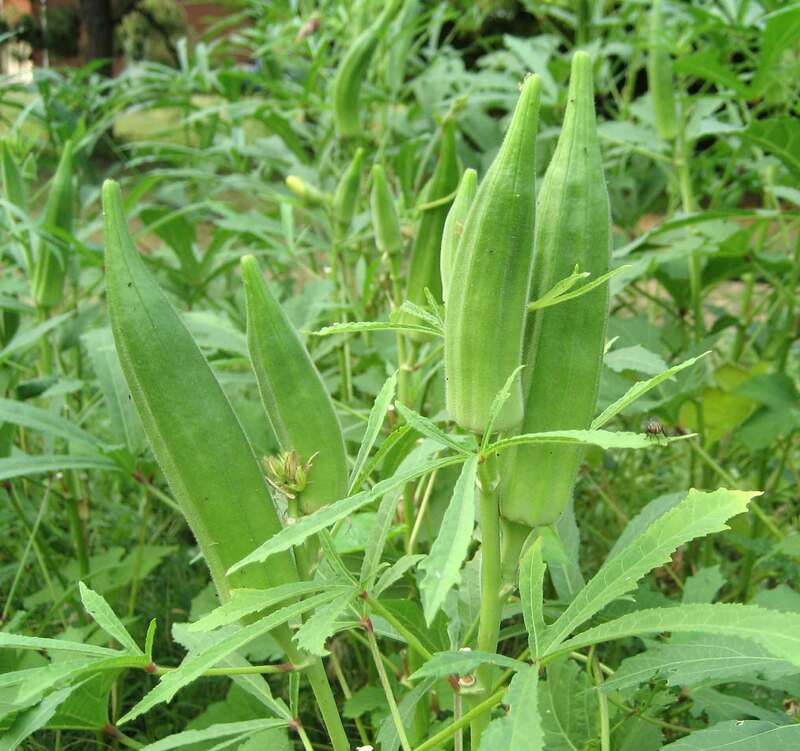 Her okra needs picking every day and gets away from you fast. Picked plenty and there are more right now I should go pick. Well, maybe I will. 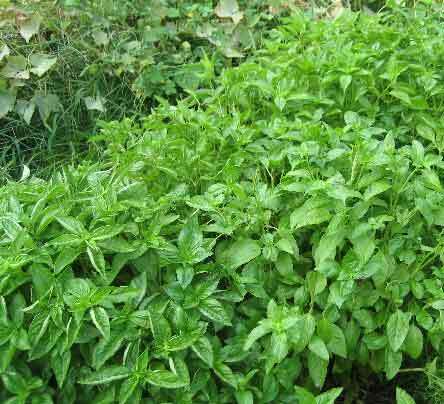 She put in a huge patch of basil and she and James picked most of it right after this and made pesto. Winter looks better already. Yum. 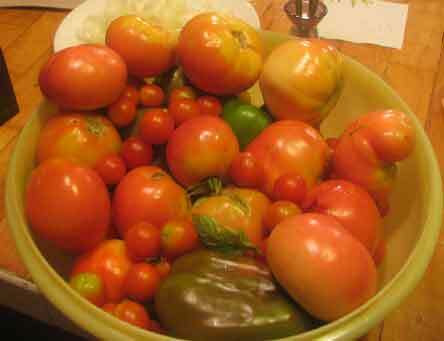 Our garden yielded a good crop of tomatoes and a mess of bell peppers. In addition, we got a pretty good crop of onions. 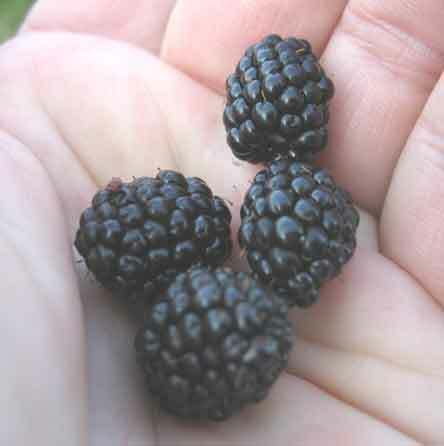 Not as many as we should have, since I waited too long to harvest them and many had rotted. But enough for a real good feast. Even though I didn't get a photo myself, I wanted to show you what I meant about how a cottonmouth water moccasin exudes danger. If you see this boy near you get away. They have no fear and will charge you, unlike most snakes who only want to get away and be left alone. 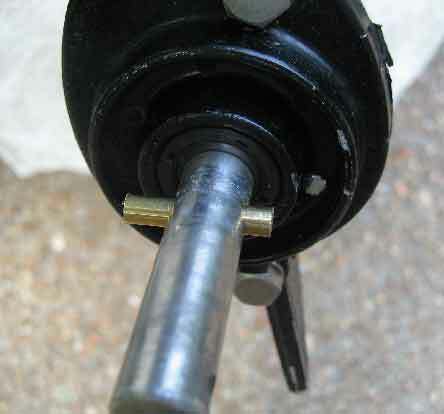 Just to show what a sheer pin looks like, this is like the one that "sheered," In other words, the pin breaks when the propeller hits something and saves the prop. 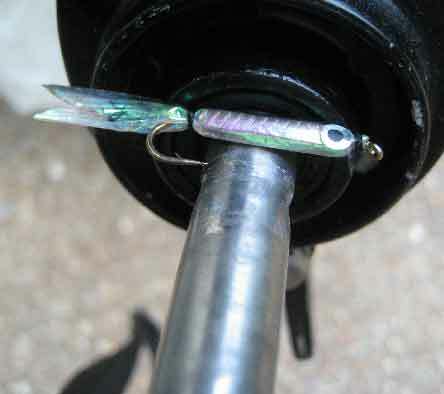 God bless this little lure. It's the last of three. The first two got me back to the ramp. Mmmm. Kiss kiss. I wuv woo! Well, it has been hot for a long time and no relief in sight until next Tuesday, August 21st! 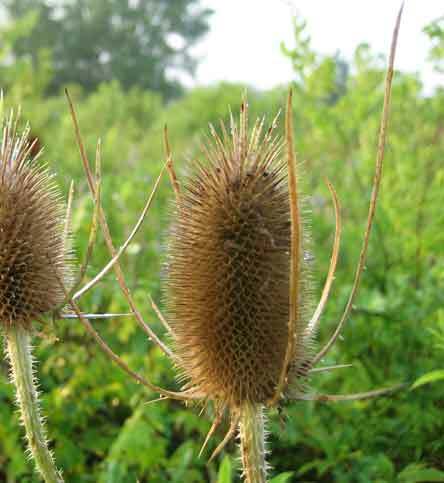 The animals and plants at Shelby Bottoms don't seem as easy to spot or maybe it's just me. And I got a toothache that got worse this week until I ended up having it out Thursday, so after Wednesday I didn't walk much. 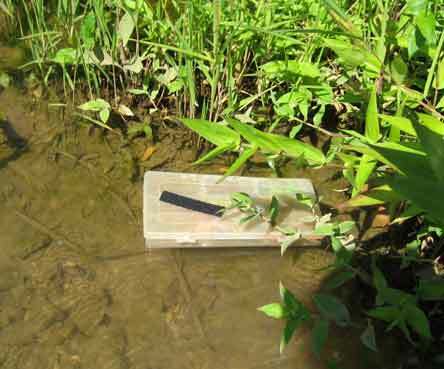 On the weekend I visited Creek J and tried out my newly repaired 1.75hp Gamefisher motor. Not so good, although it got me there and back. Have to send it back, alas. So. 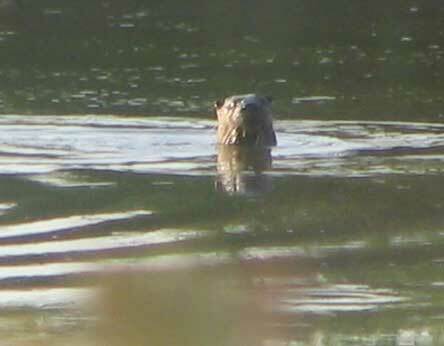 Not a great week, but I did see an osprey and got a better photo of the otter at Shelby Bottoms pond. 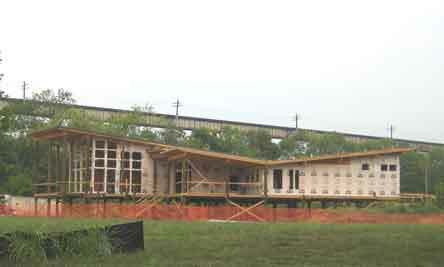 On Tuesday morning I walked down to the SB main entrance and saw that the Nature Center building was well under way. I also got a good shot of the otter. 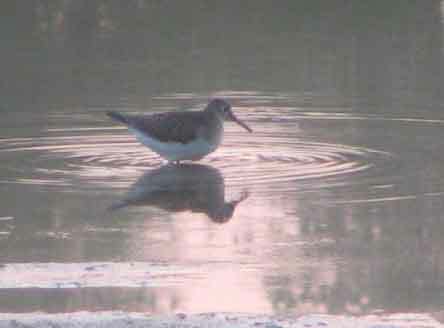 I've only seen one and at about the same time and section of the pond each time. That's my little Gamefisher that was supposed to be fixed. It still vibrates and shakes at low speeds and doesn't go nearly as fast as it once did at high speeds. Sort of like me, I guess. 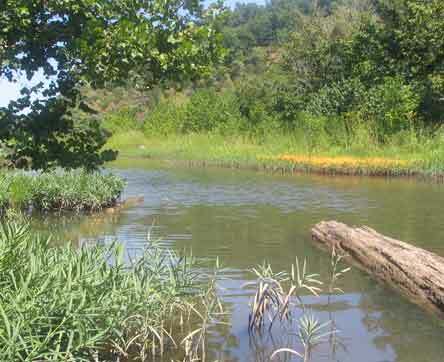 This is a nice spot at the mouth of the creek where many a bass has been fooled by a balsa imitation minnow. this one largemouth. After that they figured out what was what and stopped even glancing at the lure. On the way out I saw this osprey settle on a dead limb and got a pretty good shot. It was a good way to end the day. Thanks. Well, seems like a lot went on this week. For one thing it was really hot, over 100° many days, so walking early in the morning was a good idea. 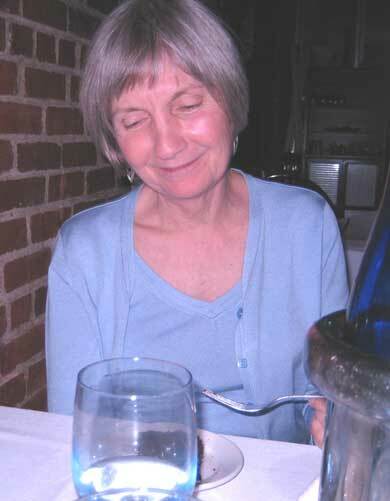 Then Sunday was Sherry's birthday, so that was special. 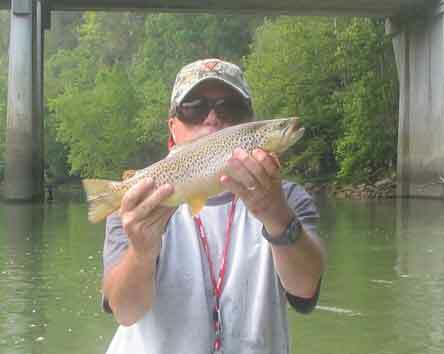 And Saturday I caught a really nice 15" brown trout at the Caney Fork. Lots of stuff for one week! 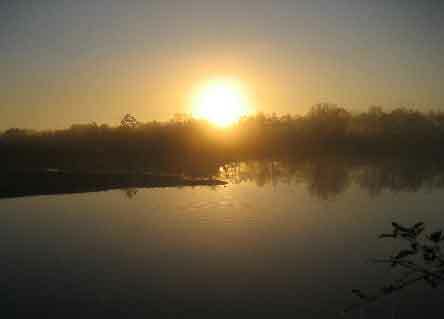 I had to fake this one a little in Photoshop, but I really saw it Tuesday morning at Shelby Bottoms. 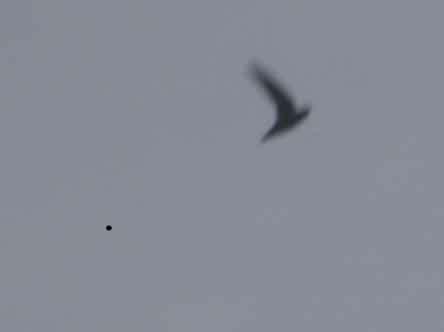 A hummingbird was chasing a swift. They zoomed over my head and out of sight with the hummer holding his own and the swift in high gear! 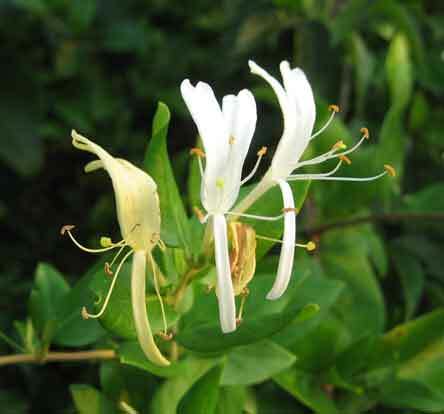 These honeysuckle blossoms caught my eye, almost like dancers. 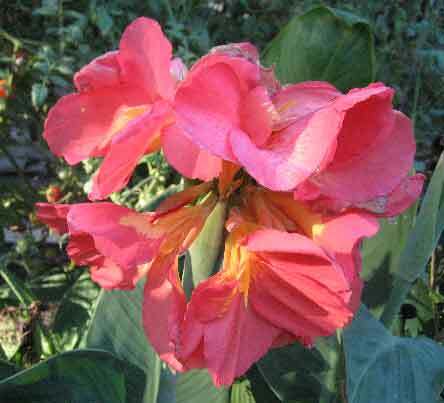 These flowers are so bright before sunrise and so nice. 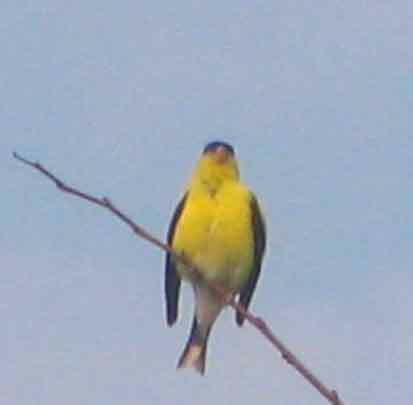 My goldfinch was at his stand guarding his territory. He's dependable and so pretty. 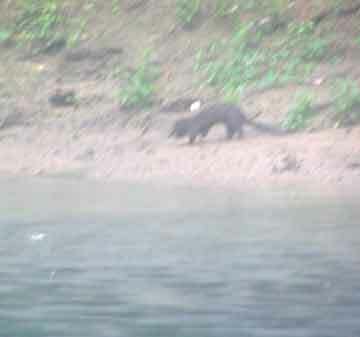 Saw the otter on Wednesday. Only one, but there are bound ... ...to be more. Hope they stay around the pond at SB. The heavy haze this week made for some amazing sunrises. Nice 15" brown caught downstream from Happy Hollow. I took the two seater. 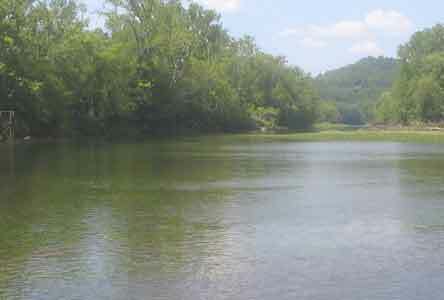 It's heavy and harder to paddle, but the extra room makes it a better choice for Caney Fork. 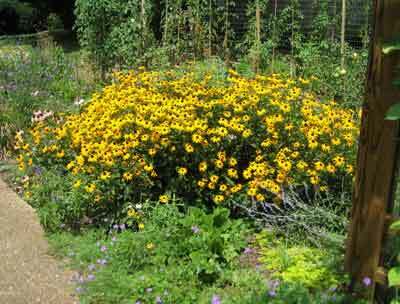 Travis had a great garden and made it pretty too with the marigolds she planted here and there. 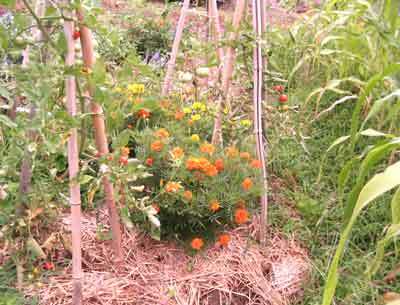 Above you have cherry tomatoes, marigolds, and corn. 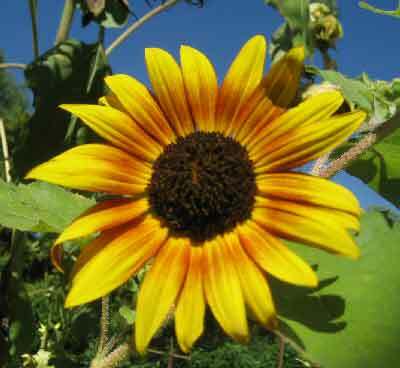 The birds are going to love these sunflowers planted next to the corn and okra. Here we are at Saffire restaurant in Franklin for Sherry's birthday celebration. She is modestly accepting the congratulations of the crowd. I thought for a while I ought to rename this site, since I'm throwing in my walks during the week. However, it does say "other good times and interesting discoveries," so I guess everything is all right and just as it should be. 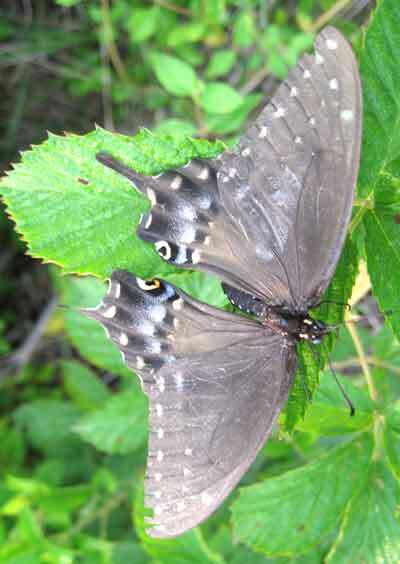 Just after sun rise and this black swallowtail was too cold to wiggle and mess up my shot. 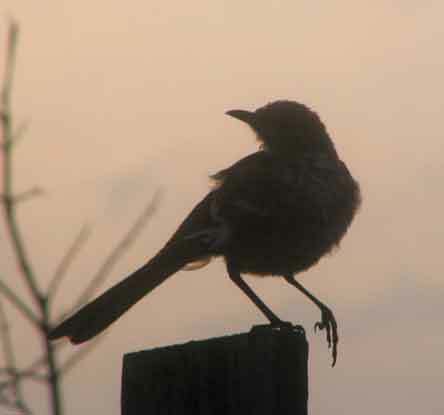 I thought this was a nice shot of a mocking bird just before he decided to take off for parts unknown. I was finding cut off beet tops in the garden, but I thought maybe Sherry was gathering beets and leaving the tops until I saw this little thief running for the fence with one in his mouth. I bated the have-a-heart trap Jim Taft loaned me with a beet and the next day I caught him. 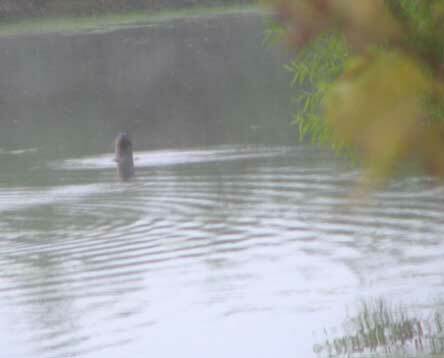 He now lives across Briley Parkway at Two Rivers Park. 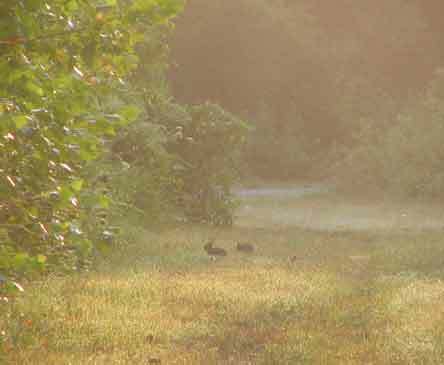 These little rabbits are at Shelby Bottoms where they should be. Their cousins got all my beans before the got three inches high. 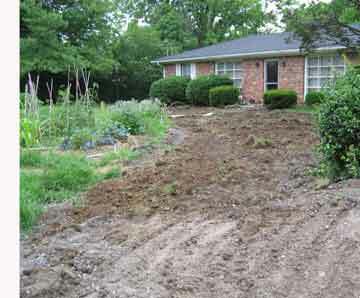 After the third planting I gave up and pinned my hopes on Travis' garden. As you will see below, my prayers were answered. I saw this plant and realized it was the still blooming form of the one on the right. Don't know what they are. Must ask Susan Stahl. 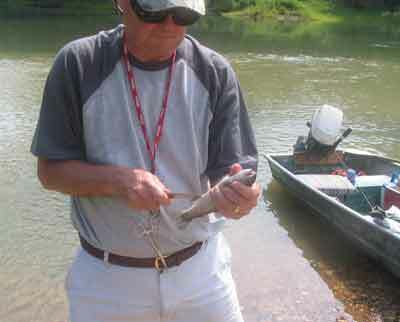 Charlie Faulkner and I went fishing Saturday on the Caney Fork and he caught almost all the trout. Oh well, I had to show him how to clean them. He picked it up pretty quick. Jim Bricker showed me long ago. 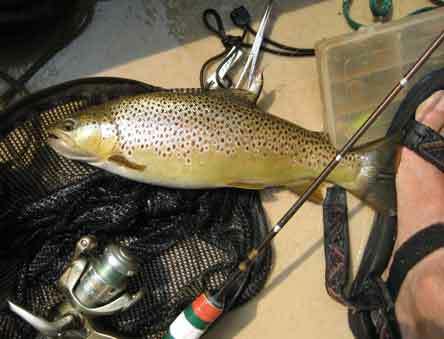 Just before we quit and headed for the take out Charlie caught this lovely 16" Brown Trout. A really fine one. It is still there and I hope to catch it myself when it gains another two inches and becomes a legal one. 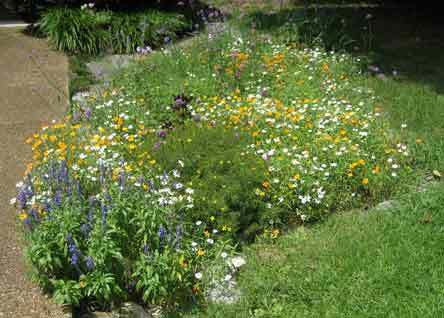 Mom's big flower bed is really getting nice now. And the smaller one isn't too bad either. The arch is coming along. Hope it gets covered completely before the cold winds stop the fun. 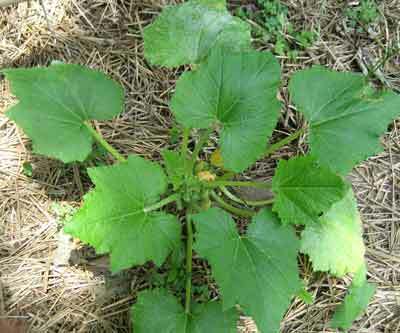 Last year Travis had a great big squash plant that was slow developing but did great late in the season. This year her squash died. I have this one and it may develop too slow to bear fruit. 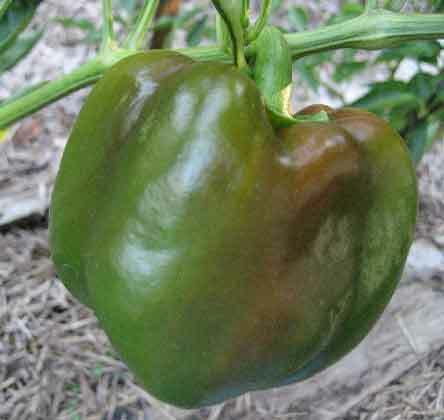 Got lots of nice bell peppers though. My cucumbers have also done well. Enough for us and Travis and James. 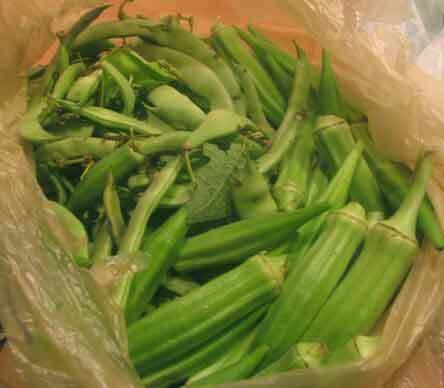 This is the second week I've picked roma beans and okra at Travis' garden. They sure are great. 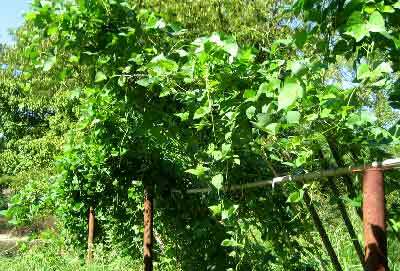 This week the string beans came in and Travis had a really good crop. Should be enough for another picking next week too. 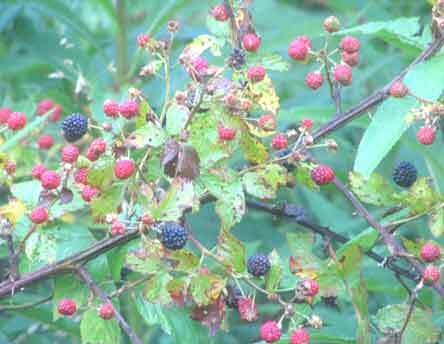 The black berries at Shelby Bottoms are still coming on, but the bushes are drying up. We could use more rain. 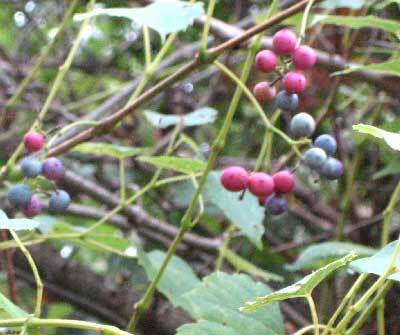 Actually, I think these are dew berries. But good! Except the seeds stick between the teeth something cruel. 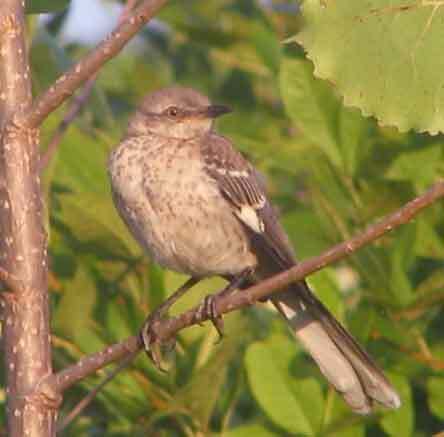 I'm seeing lots more mocking birds now, whereas earlier the robins were the dominant bird. 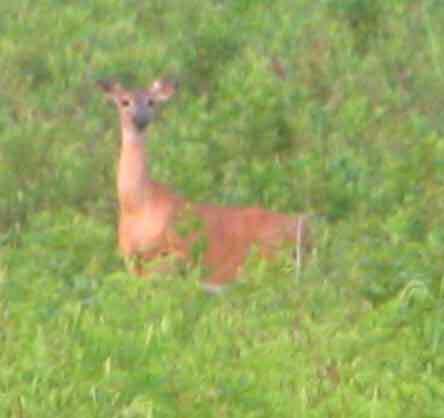 Saw this doe near the observation platform where they had just cut back the brush and small trees. When she ran her fawn jumped up and ran with her. Didn't get a good photo of them. 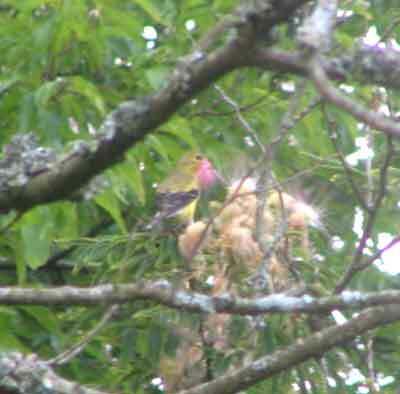 Plenty of goldfinches now in their courting plumage. 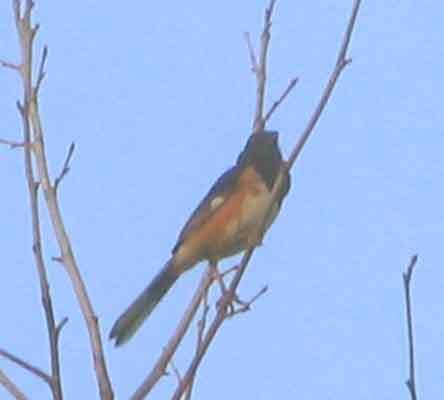 This one has a favorite tree top and can be found there most mornings. 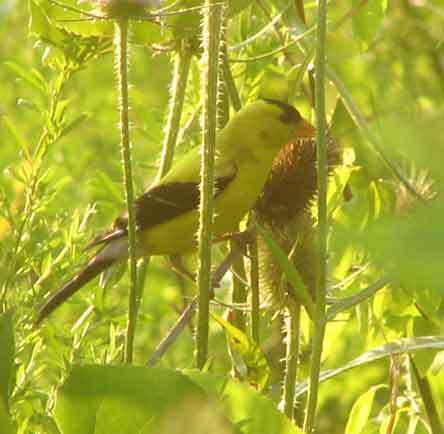 He flew off and when I passed him again he was feeding on these plants. 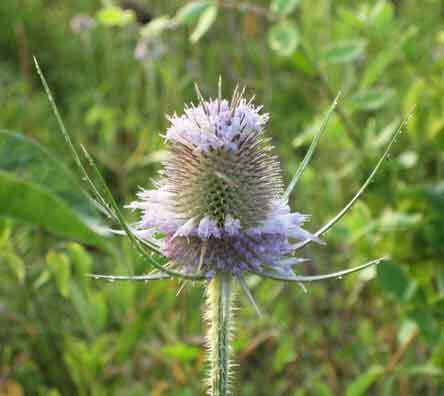 Thistles? Have to ask Susan Stahl. 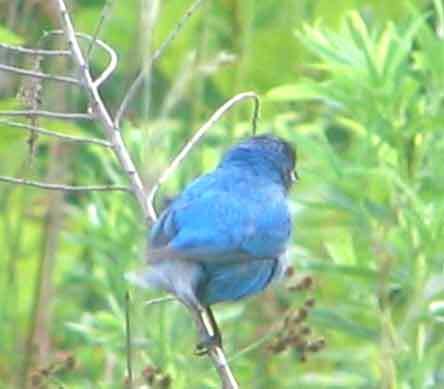 The indigo buntings are still courting hot and heavy. But getting a close shot in good light is rare. Lots of butterflies feasting at the boat launch ramp at Creek J on Saturday. 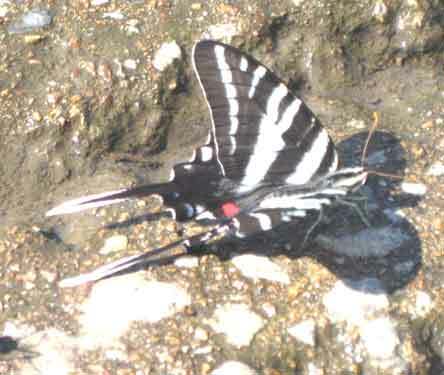 This zebra swallowtail is one I seldom see.. I took Sherry's sit on kayak way up the creek. Had a huge bass slam my lure near the base of the tree up ahead, but she threw the lure and blew me a kiss before heading for parts unknown. I got out on a gravel bar and ate after losing the "Big One" (yet again). Then I looked for my little tackle box and, horrors! it was gone! I tried to be calm and remember when I last changed lures. I figured that if it was floating I had a good chance of finding it and if it sank, oh well. God was good. Thanks! 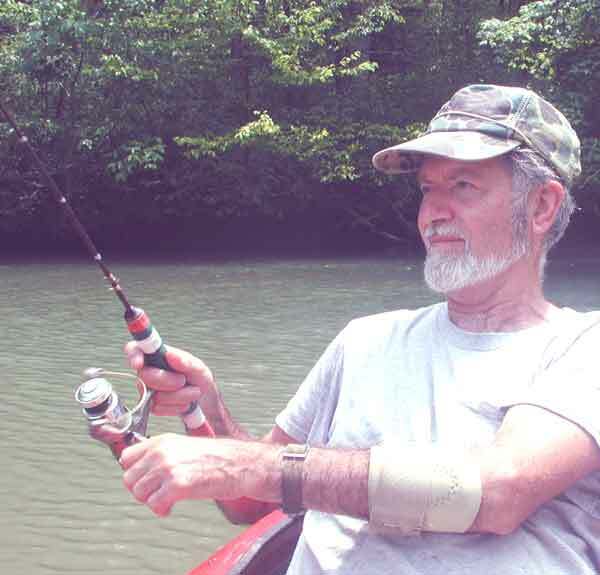 Sunday, after finishing all my chores like a good boy, I took the jon boat up to Caney Fork. 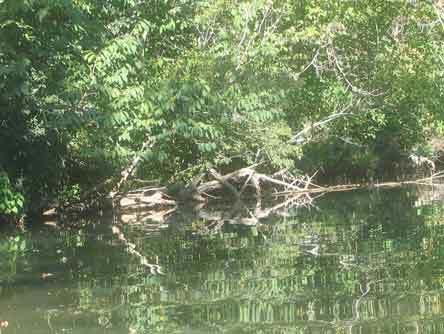 The water was clear and high and I went upstream past the old store at Lancaster where the road takes a right angle turn and begins to parallel the river. 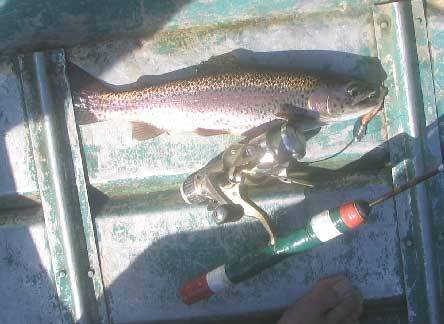 Saw lots of trout and caught a few browns but only one rainbow. But this was a good healthy 14" one that will feel the two of us. Well, we were traveling last weekend. Took sister Ann to see son Hanley in Lexington. Then Hanley came down here with us so he could see his little niece. Busy weekend, but not much fishing or farming. 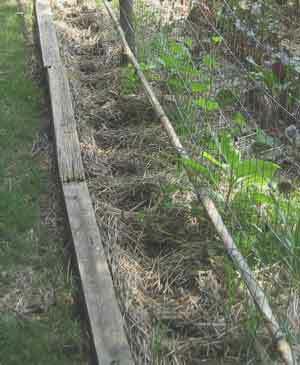 The following weekend, however, I got the garden weeded and generally whipped into shape. Sunday I packed up Sherry's sit on top kayak and went fishing. Got all the way to the creek and discovered I'd left my rod and reel at home! 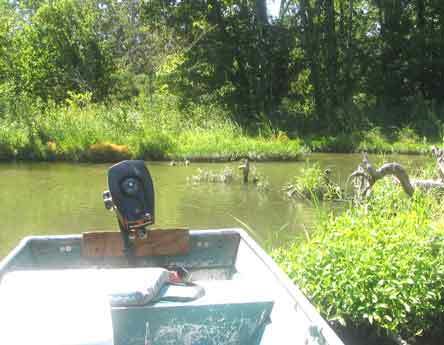 Oh well, it was peaceful to just cruise quietly, relax, and look at critters and the scenery. Here's a real downer. 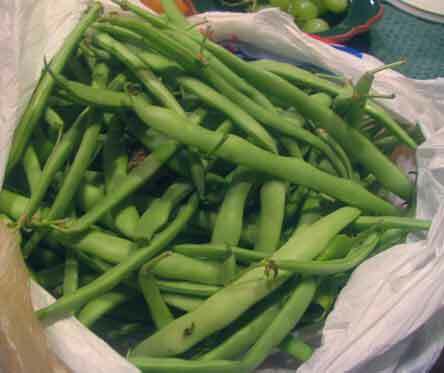 Rabbits have eaten both butter beans and string beans at least three times. Seems to be all they eat, but they must love those! 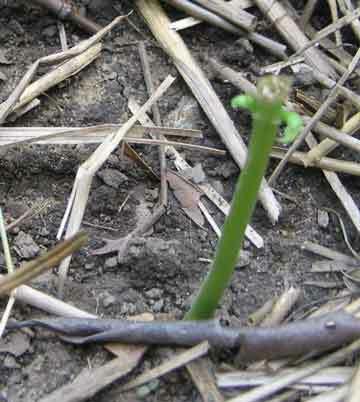 All that's left of a promising young bean plant. After replanting three times I think I'll concede to the bunnies. 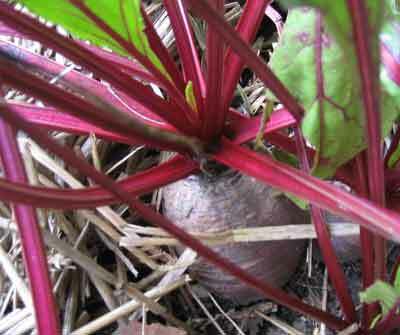 The beets have done great, however, and we are eating and sharing them almost every night. 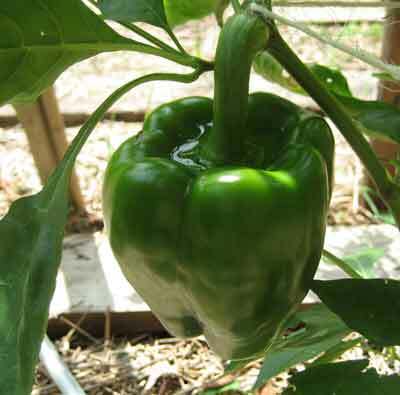 We have got one or two peppers so far and more on the way. The birds have pecked a couple, but most will be fine. 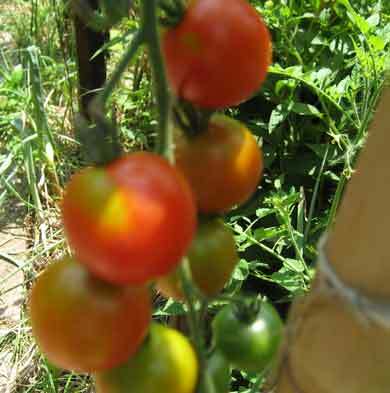 The big tomatoes, the Bradleys and the Early Girls, are doing well, although I'm pulling them early to avoid the bird pecks. 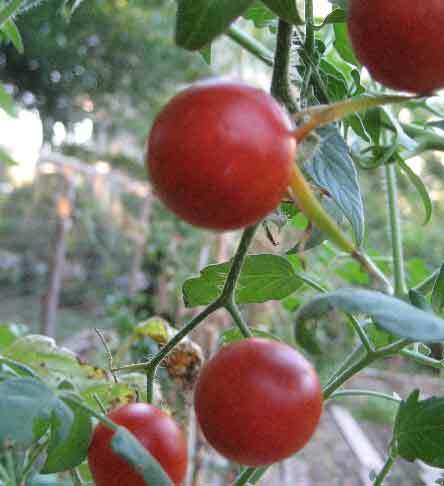 Lots of cherry tomatoes and I'm pulling them a little early too. 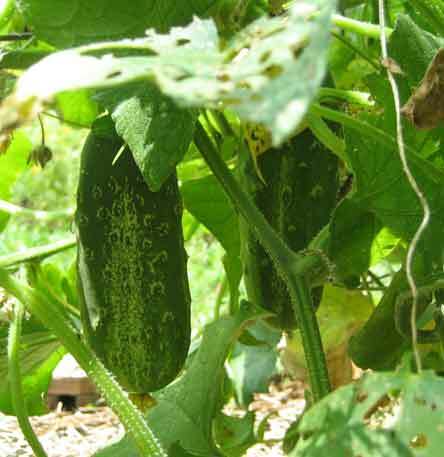 I planted four pickling type cucumbers and they are really coming in now. 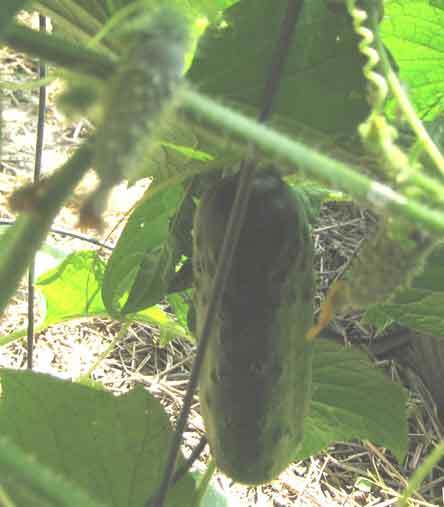 We'll have to pickle some pretty soon to keep up. The eggplants are doing great. Unlike previous years where the little bugs made lace of the leaves early on and then they had to slowly come back, this year they have escaped pretty much whole. 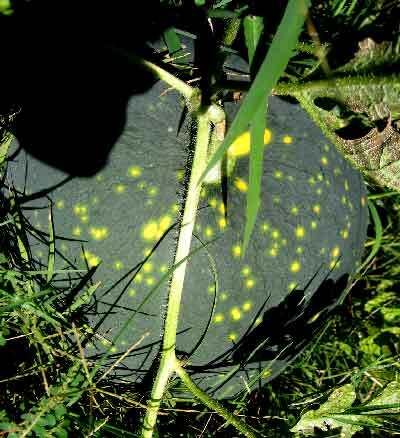 We have four or five baseball size fruits coming along. 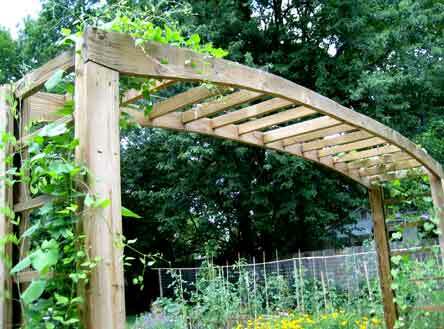 The great arch is slowly getting a covering of morning glories, clematis, and wisteria. Sherry took out the jasmine because she found out the leaves are poisonous and we've got the grand baby to worry about now. No use taking chances. 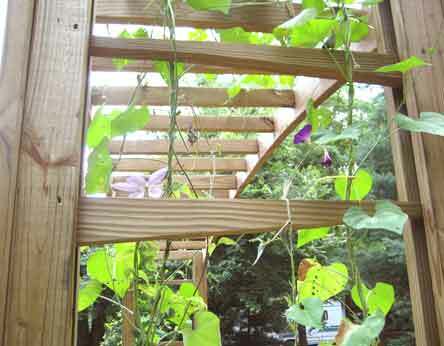 Morning glory and clematis blossoms look great. 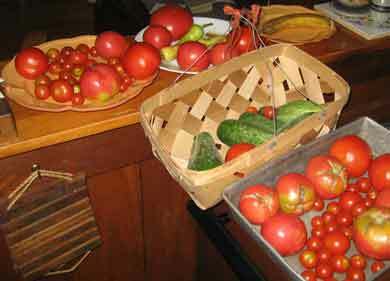 Some of the early bounty from our little garden. 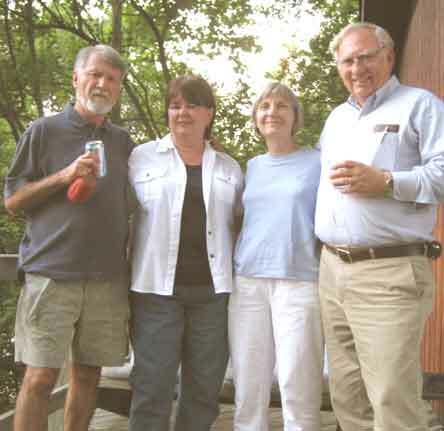 Gina and Pat Mann were in town Saturday and we had them out for drinks and dinner. They are in town for a convention on control of water plants (Pat is responsible in Lee County). Even though I forgot my fishing gear I enjoyed just looking. This lovely little plant may be some kind of orchid. Anyone know? 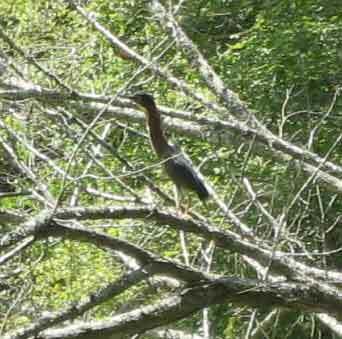 This green heron kept flying ahead of me. He must have jumped up five or six times. Did he ever hear of going behind someone? 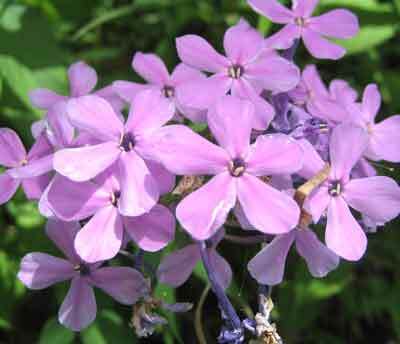 Sherry says this is phlox. It sure is lovely. 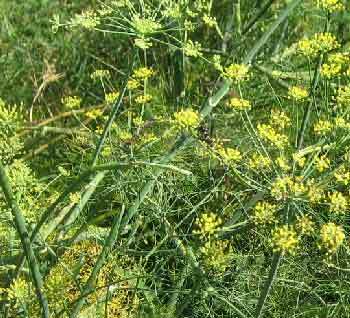 This yellow vine is growing all over the base of the cattail bunches. 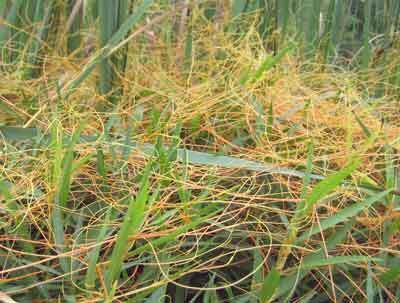 I had no idea what it was, but Sherry tells me it is dodder, or love vine. How about that?. 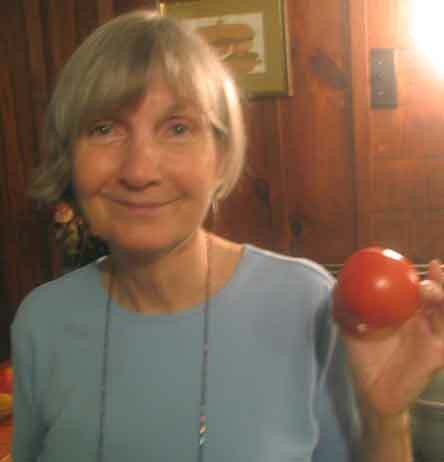 Instead of a can of beans I took half a baked potato, a tomato, and salt. 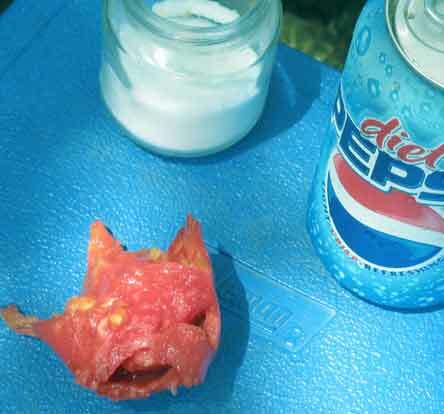 And, of course, my favorite fishing beverage. Sherry's kayak will go in 4 inches of water, which is about how deep it is here. 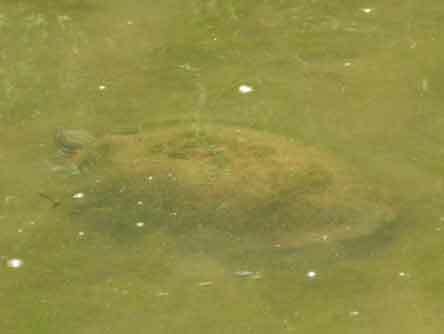 This turtle sat on the bottom and hoped I'd go away since there wasn't any where else to hide. It worked! Well, that's what happens when you get behind. So just hang on and I'm gonna try to catch up! 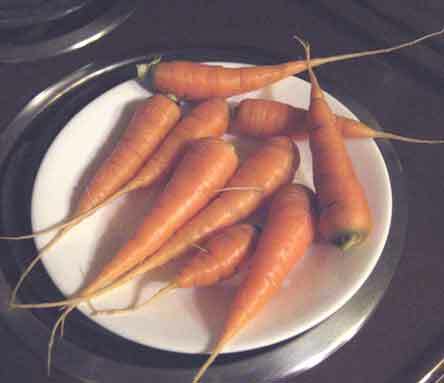 Pulled some carrots to thin them out and got these pretty things. 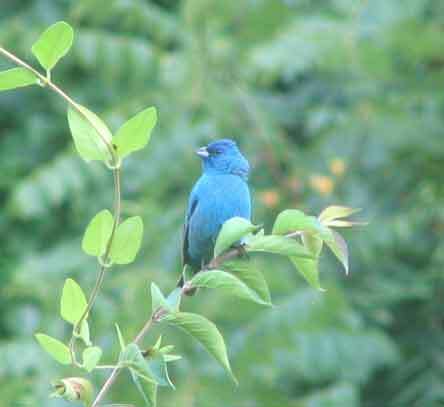 Male Indigo Bunting at Shelby Bottoms on Tuesday morning. 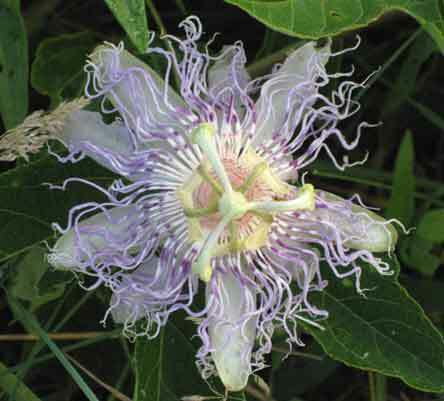 The passion flower is the bloom of the maypop vine. 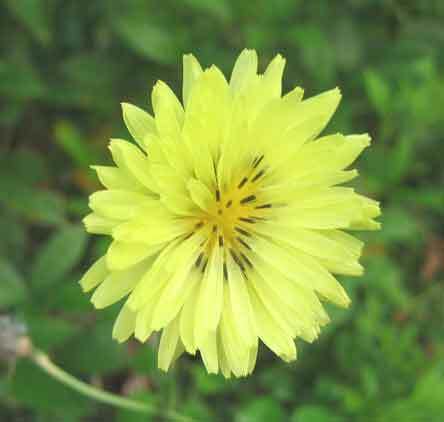 It's the Tennessee state wild flower and certainly is pretty. 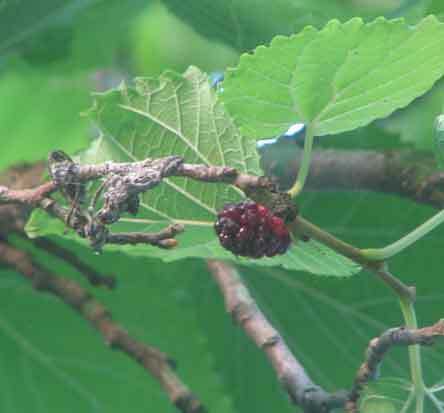 The big April freeze got most of out fruit trees, but this mulberry tree has a few just coming into maturity. Much later than normal. No big flocks of cedar waxwings eating them this year. Pretty good photo of male tohee singing to attract a mate. 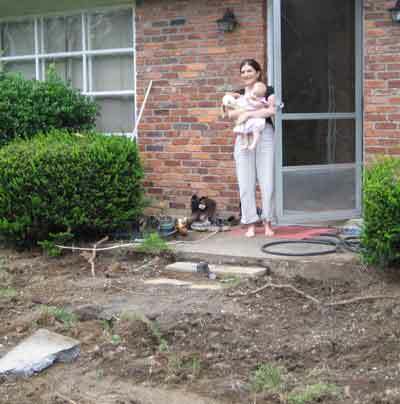 James rented a Bobcat and scraped the old drive out and angled the dirt away from the house, but it sure did leave a mess. Travis and Zinnia survey the work. While James was doing all the grading work I was up at the Caney Fork fishing hard. Didn't get many fish but I did get this crumby photo of a mink or weasel who was swimming across the river and then ran down the bank. 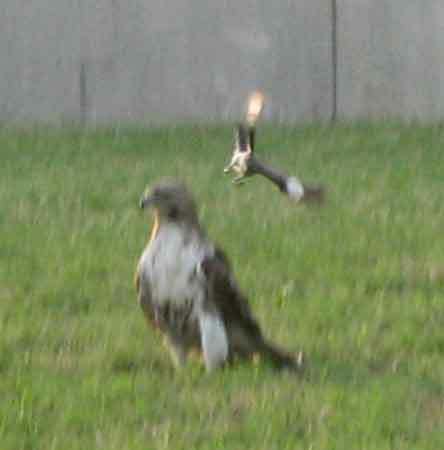 Monday I was walking at BiCentennial Mall before heading to the Y to teach the yoga class when I saw two mocking birds worrying the hell out of a big hawk. 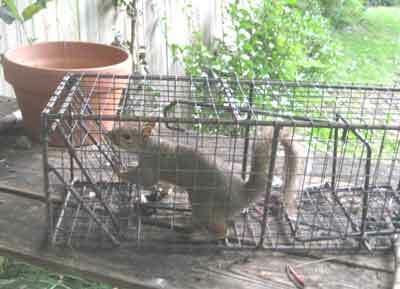 They worked together and finally got him out of there, but not without some close calls. Sister Ann came down from cold Maine to see her little niece and celebrate the 4th with us. 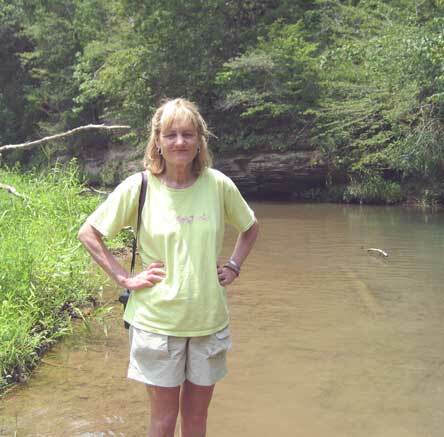 On the 5th I took her up to Creek J where we floated in the two seat kayak and got out where it got shallow and walked up the creek a way. It was a great day and very peaceful and nice. Even though the fish were not biting much it was just nice to be there. 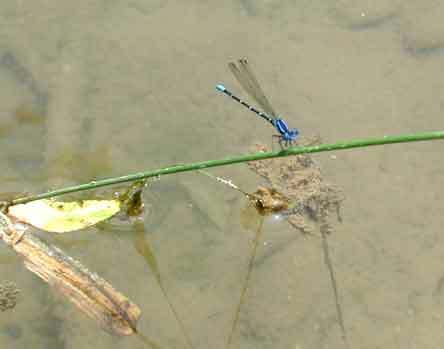 Ann's photo of a neon blue damsel fly on a twig. Great shot! 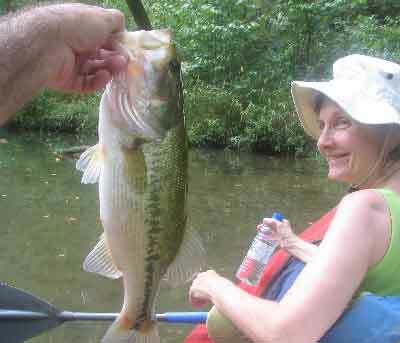 I don't have many photos of me fishing, so I was glad she took this one, even though it was one of many fishless casts. 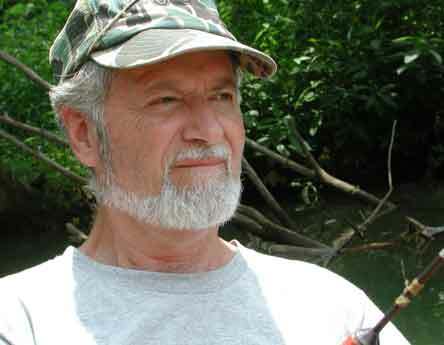 Charlie Faulker and I finally got it together and met at Betty's Landing on Caney Fork River. 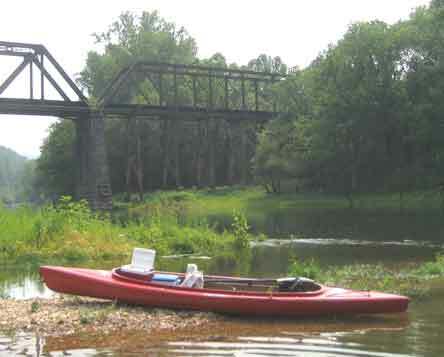 We went upstream in my little boat and parked below a long run just below an interstate bridge. 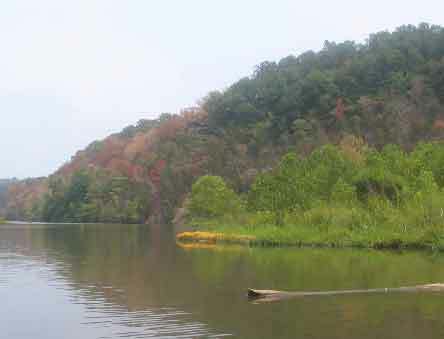 Neither of us had fished this area before and it was a great day on the river. We both caught numerous trout. And each of us got at least one over 16 inches. Big husky brutes. I brought home six of them and two fed Sherry, Me, James, and Travis. We saw rain coming and had sense enough to get under the bridge and stayed pretty dry. This was good, because without the sun it can get pretty cold wading the Caney in shorts. Next day I went back, but the sun was out and though I caught 7 or 8 none were as nice as Saturday. But I'm not complaining. Good weekend all around. 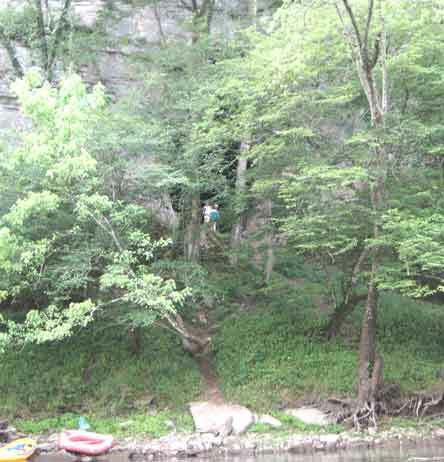 On the way upstream we saw some rafts and the people in them were exploring a really big cave in the cliff. 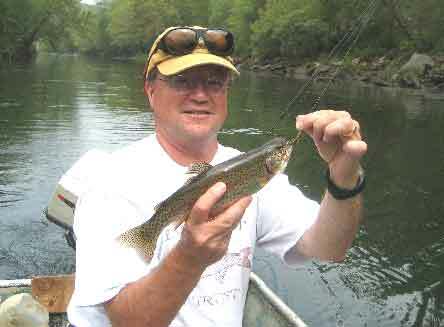 Charlie Faulkner showing off one of the fish we caught, a healthy 14 inch rainbow. On the way back we found a stretch where the brown trout hang out. 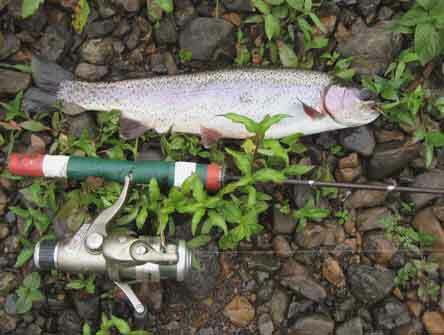 One of the solid 16 inch rainbows we caught. Sherry and I enjoyed one for dinner last night and James and Travis had another. Charlie used a silver and black #7 Rapala all day and it did the job on both rainbows and this brown. Here we are cleverly waiting under the bridge for the rain to stop. After 15 minutes it stopped. Who said getting older was all bad? Of course, neither of us brought ponchos, either. 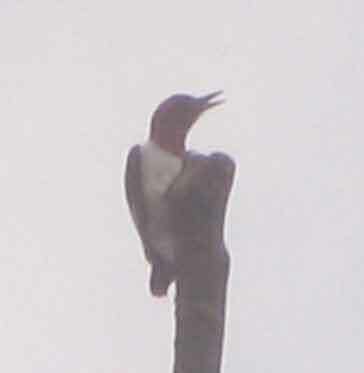 I got all excited by spotting a pair of red headed woodpeckers, the real thing. Got a long shot which isn't the best, but still a thrill. Good shot of the wing markings. They are just beautiful birds! Got home in time to pick our first "Early Girl" tomato. Joy!